I've always wanted to visit Cornwall. I pictured long walks on grassy slopes above the ocean. I planned the trip for the end of May hoping there would be an abundance of wildflowers then. 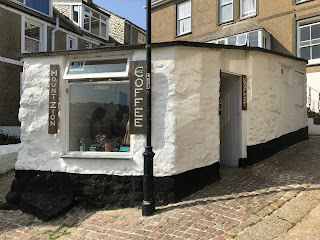 There were! 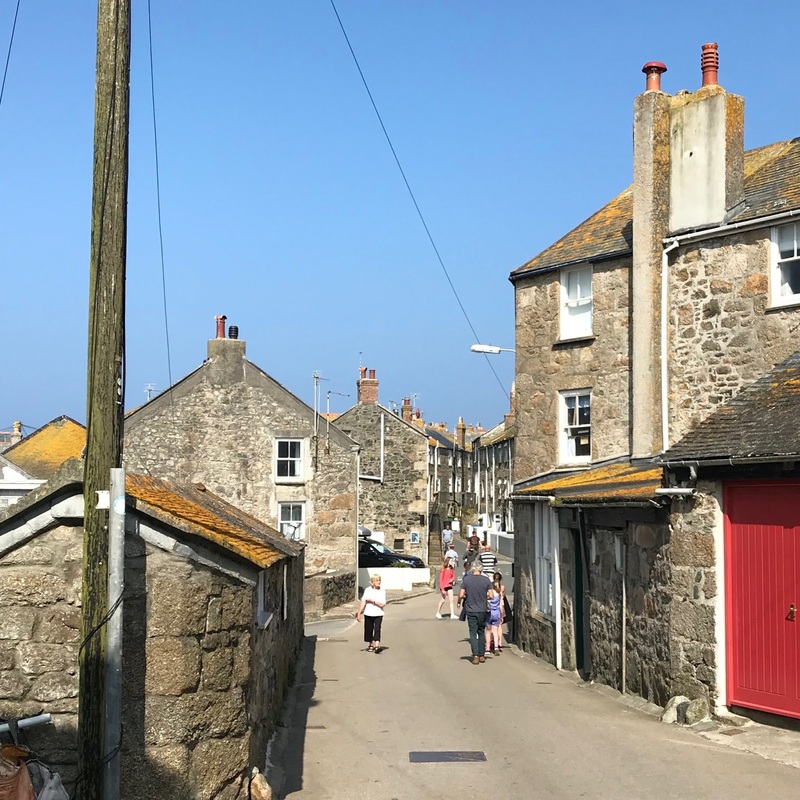 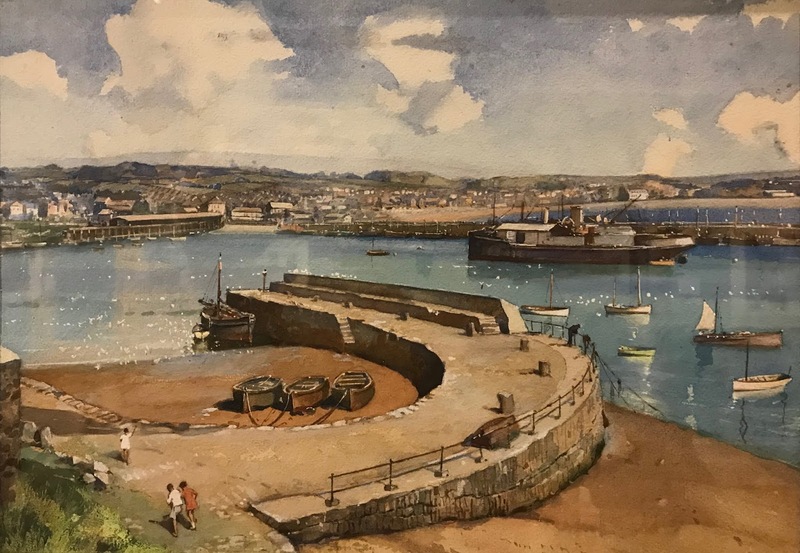 I've been curious to see St. Ives, a town at the far west end of the peninsula, where a community of artists gathered starting in the late 1920s. 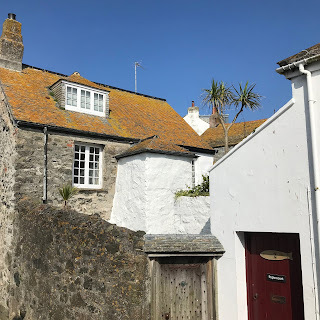 They were drawn by the ocean and harbor views, the white washed homes, unheated perhaps but cheap, as well as by the freedom that distance from convention affords. 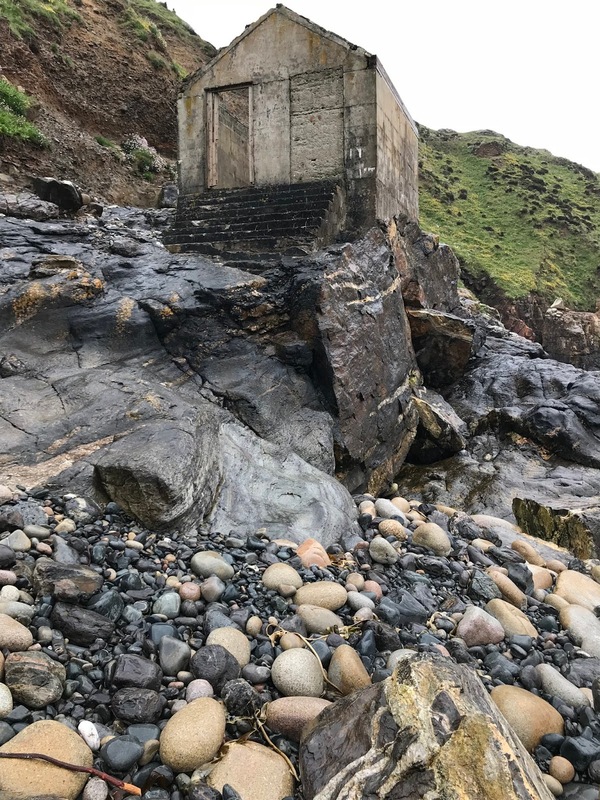 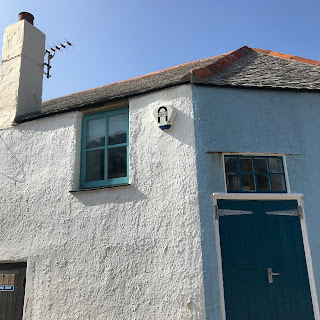 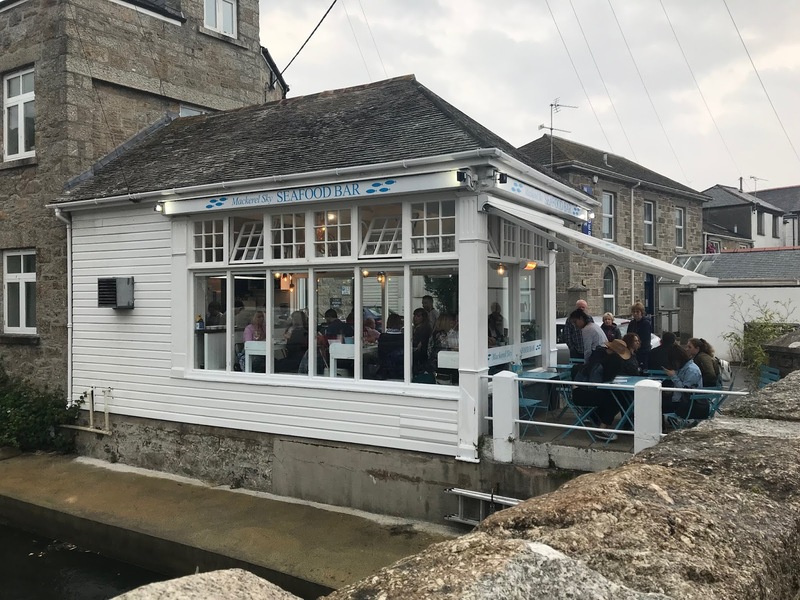 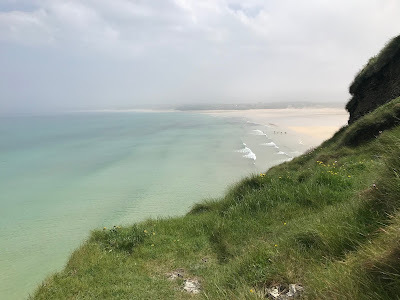 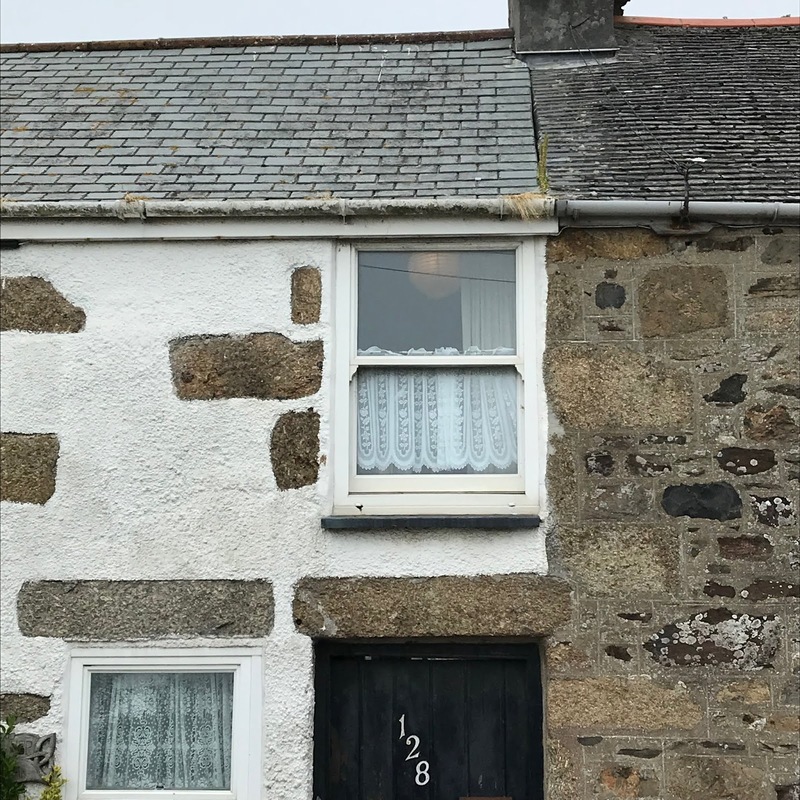 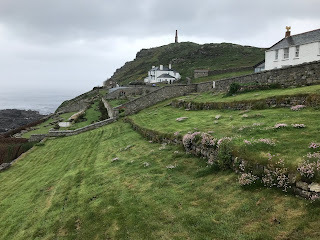 In addition St. Ives was the real setting for Virginia Woolf's "To The Lighthouse", (1927), a place she summered as a child and returned to later. Photos are taken by me or my husband Steven, unless otherwise credited. 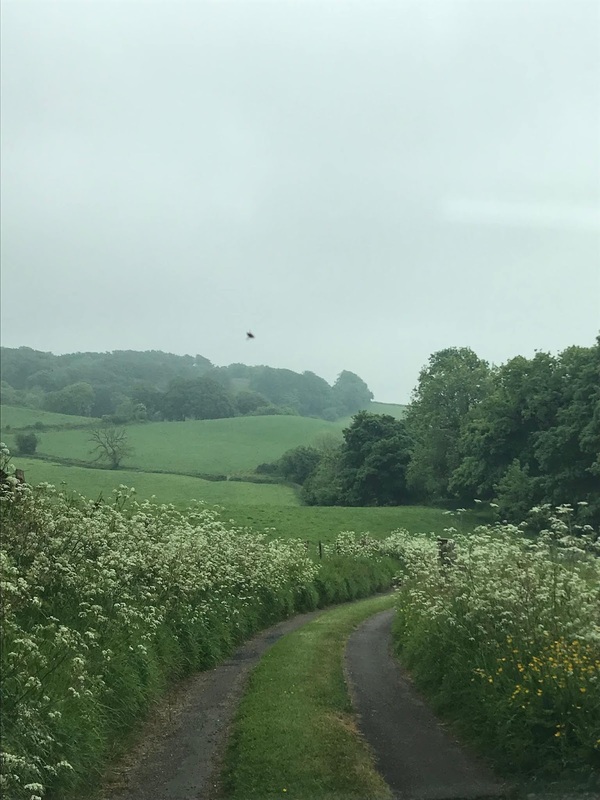 Above: A drive through Dorset on the way to St. Mawes. 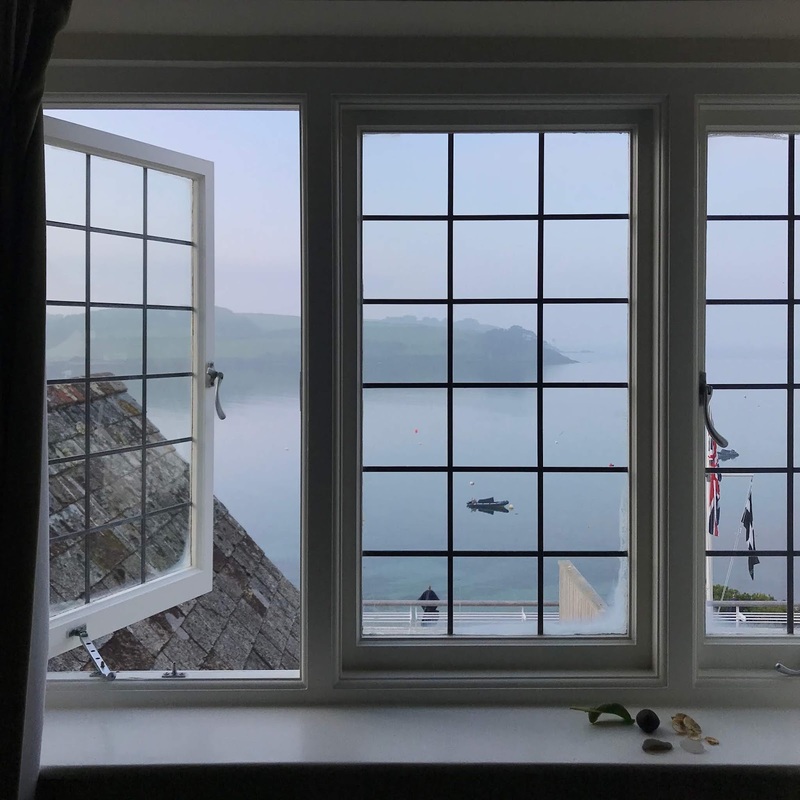 We started the trip with a night in St. Mawes, at Hotel Tresanton. It's set on a promontory at the end of the Roseland Peninsula. 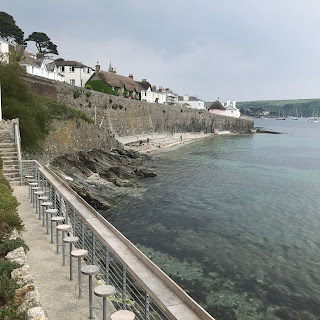 From St. Mawes a 20 minute passenger ferry takes you to the small fishing town of Falmouth, and a 10 minute ferry ride the other way takes you to St. Anthony's Head, a beautiful area for walking. 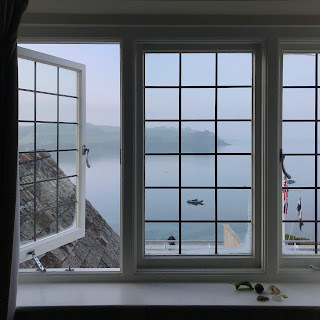 Above: View from our room. 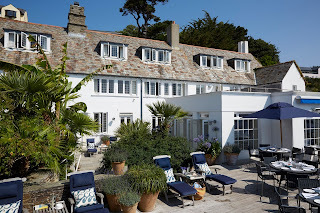 Above: The beach club cafe at the Tresanton. 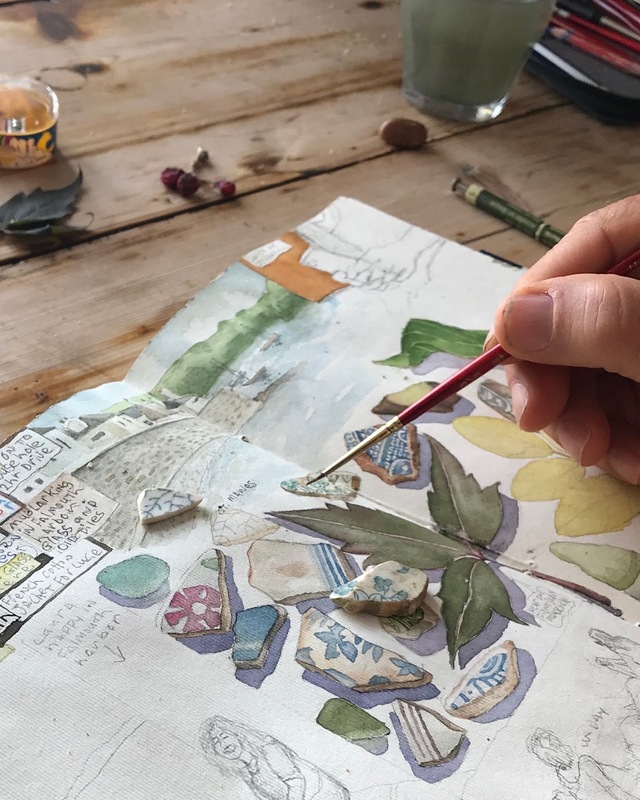 Above: Steven's watercolor of St. Mawes, with tiles found on the town beach. 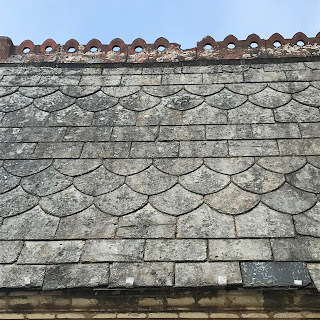 Above: Many roofs have terra cotta punctuation where planes meet. 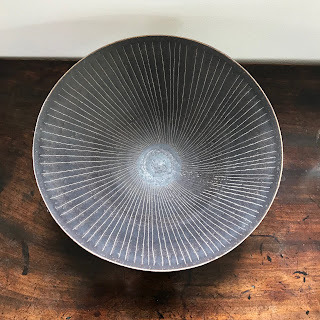 This one has slate patterns as well. 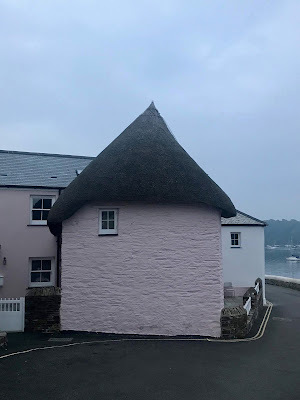 Above: Pink house with a thatched roof. 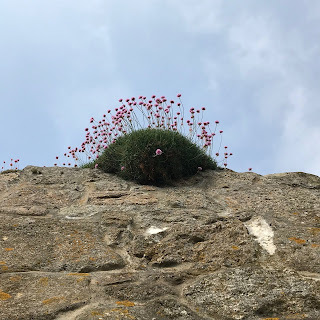 Above: White washed stone walls with flowers growing out of the top, and a glimpse of the sea. 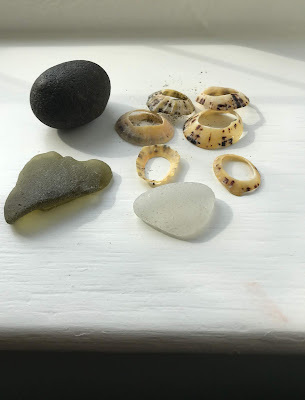 Above: Sea glass and shell rings on the windowsill of our room. 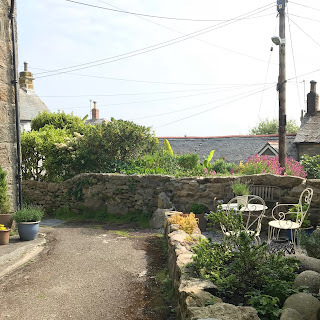 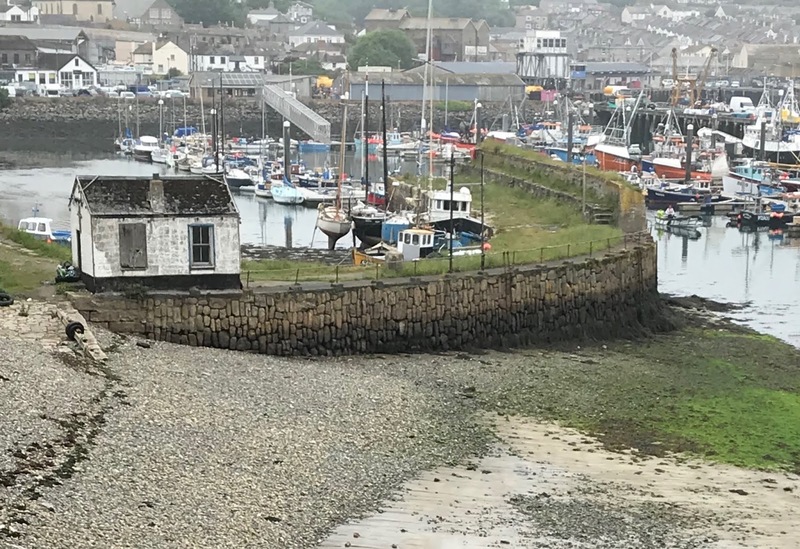 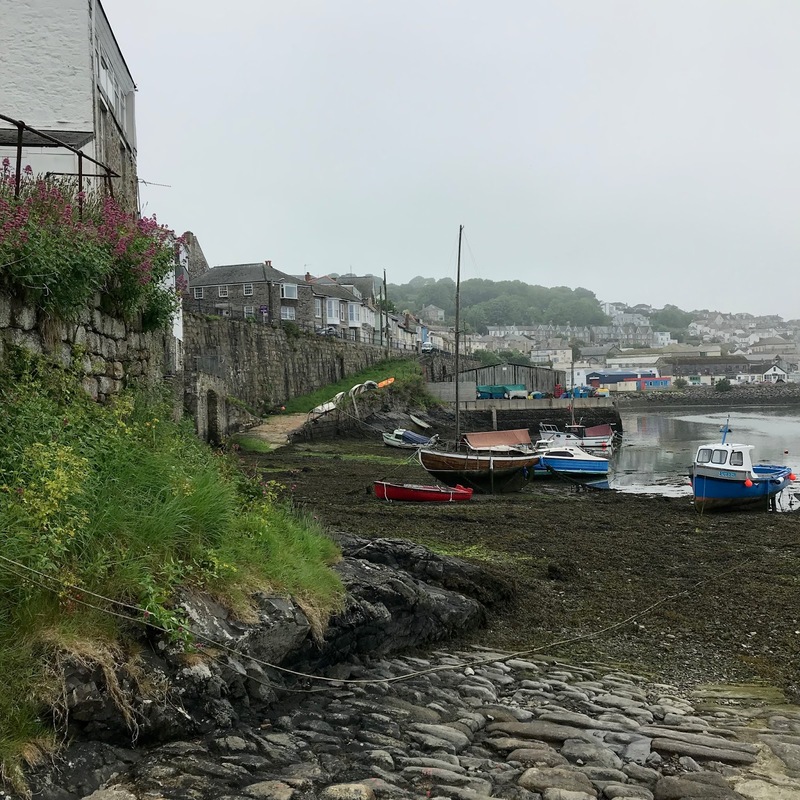 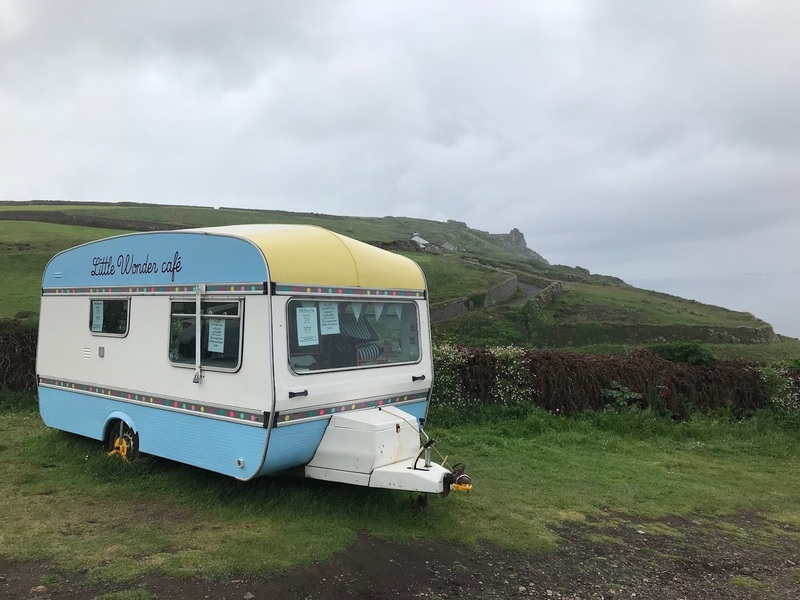 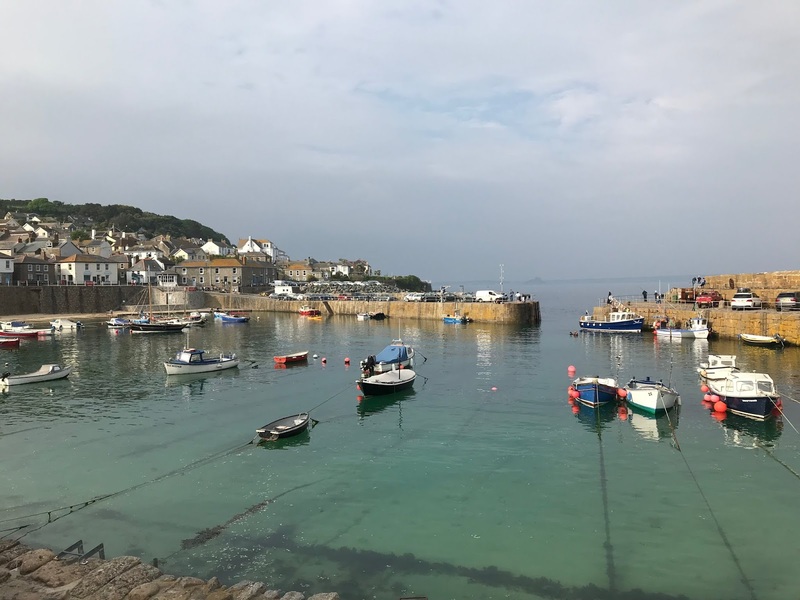 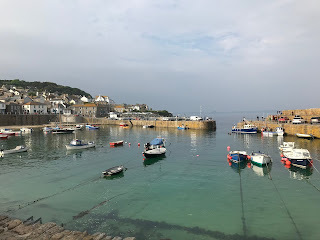 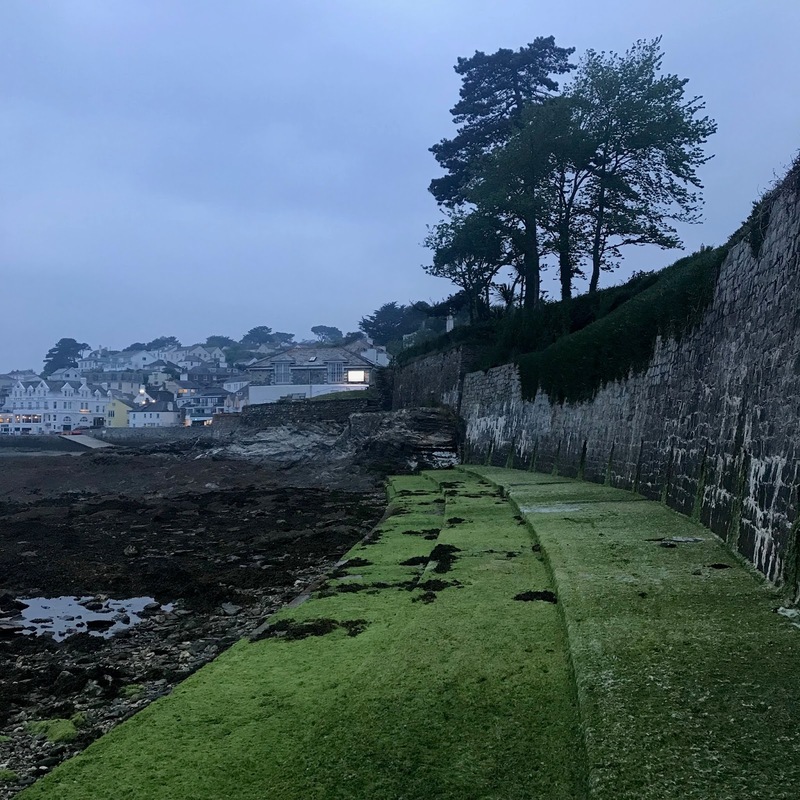 The next afternoon, another couple of hours driving through roundabouts and narrow lanes between tall hedges brought us to Mousehole (pronounced mowzle), where we'd rented an apartment overlooking the harbor. 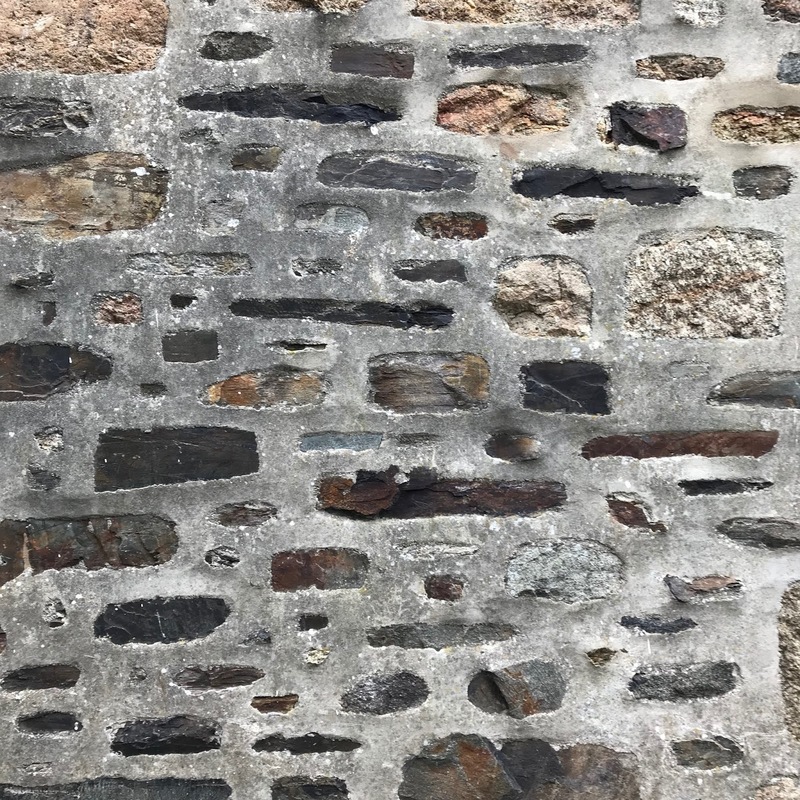 Mousehole is easily recognized by it's distinctive sea walls. 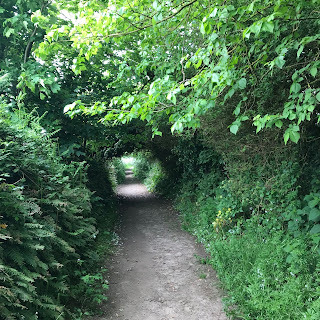 They almost meet, like two arms coming together, but not quite touching, leaving a narrow passage in the center. Above: A view of the Mousehole harbor from Raginnis Hill above. 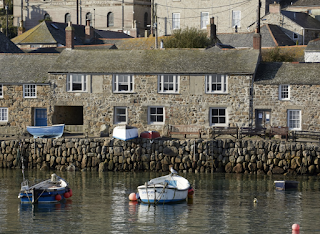 Above: The Mousehole harbor at high tide. 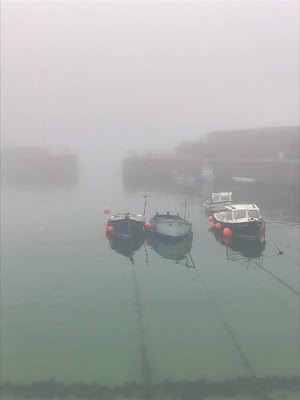 Because all the water comes in and out of the single narrow opening all the boats are pulled in the same direction as the tide goes out. Above: This painting of Mousehole Harbor by Harold Harvey (1874-1941), 1922, shows the Ship Inn at the left. It's still in operation, and we had a good dinner there our first night. 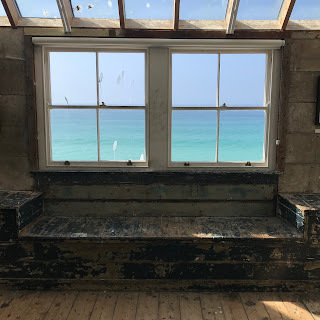 The place was packed but we found a windowed alcove in the bar. 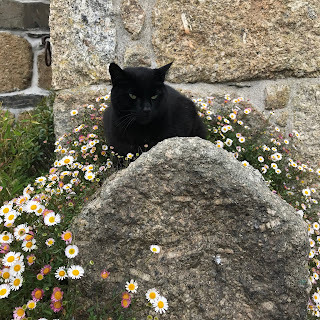 A very friendly spot. Above: This was where we stayed. 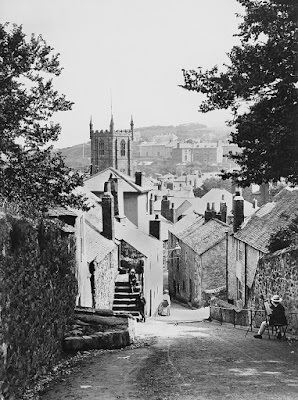 Above: The British are long walk enthusiasts. 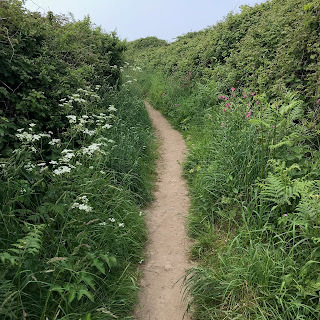 There are sign posted public footpaths through fields and woods and towns crisscrossing all of the UK. 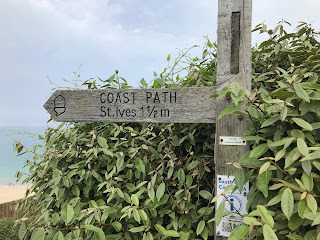 In addition there's a coastal path around the perimeter of Cornwall. 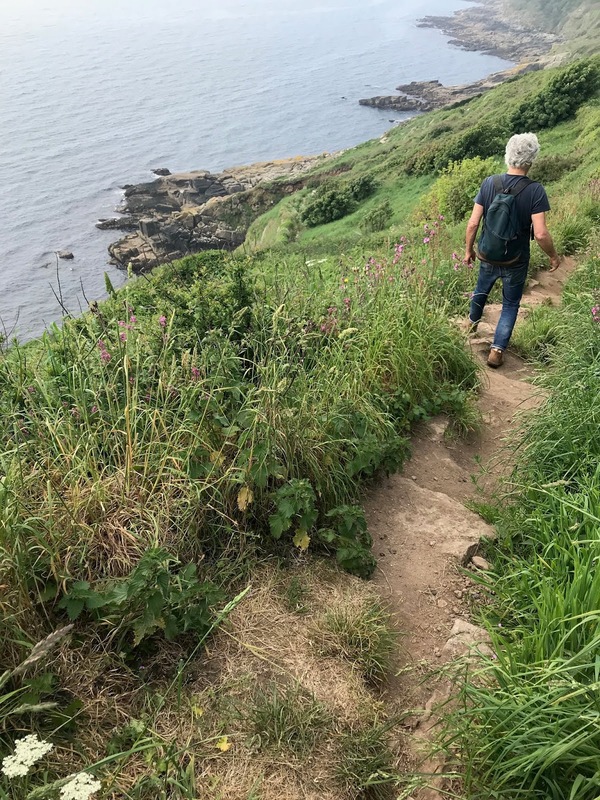 The full walk takes about a week. 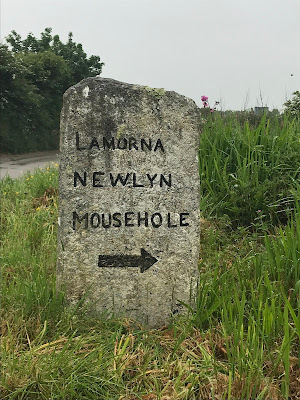 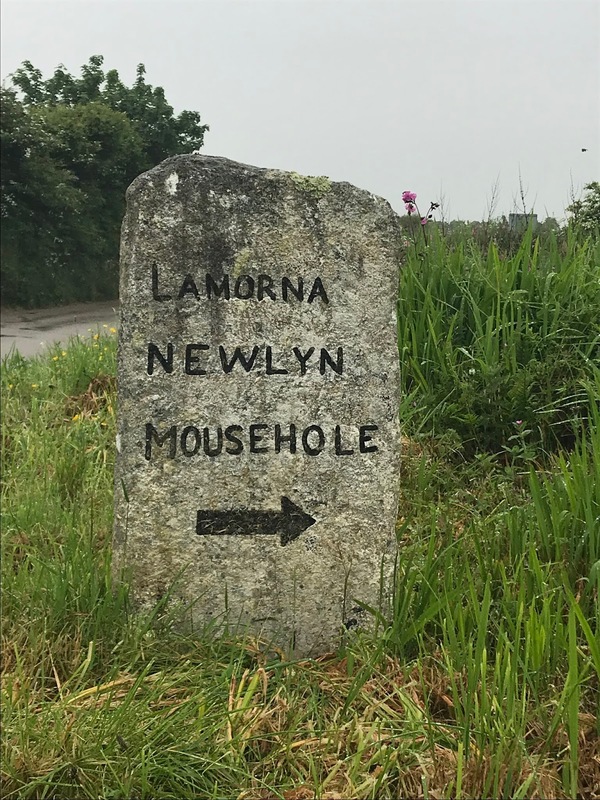 We did a small part of that walk from Mousehole to Lamorna the first morning there. 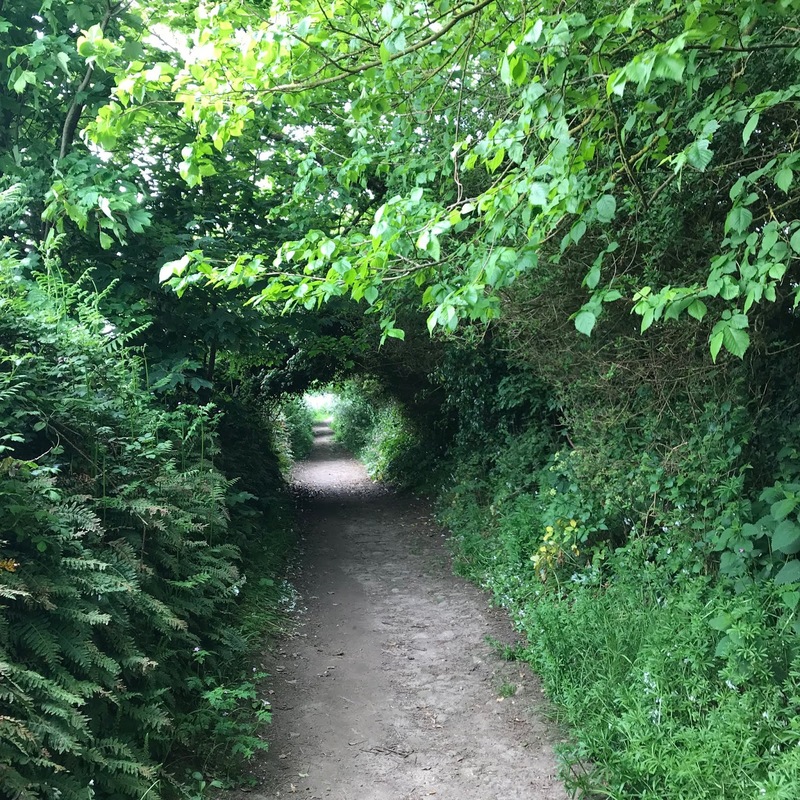 The road above is part of that walk that goes through town, leading you to the wilder parts. 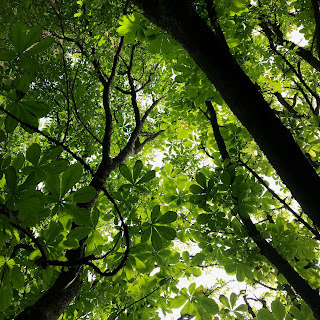 Above: Looking up through Chestnut leaves. 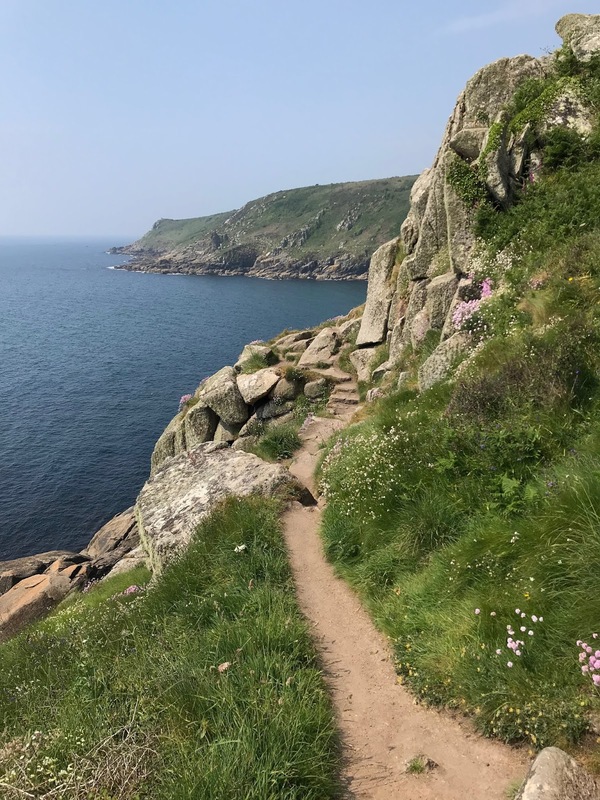 Above: Heading down towards Lamorna. 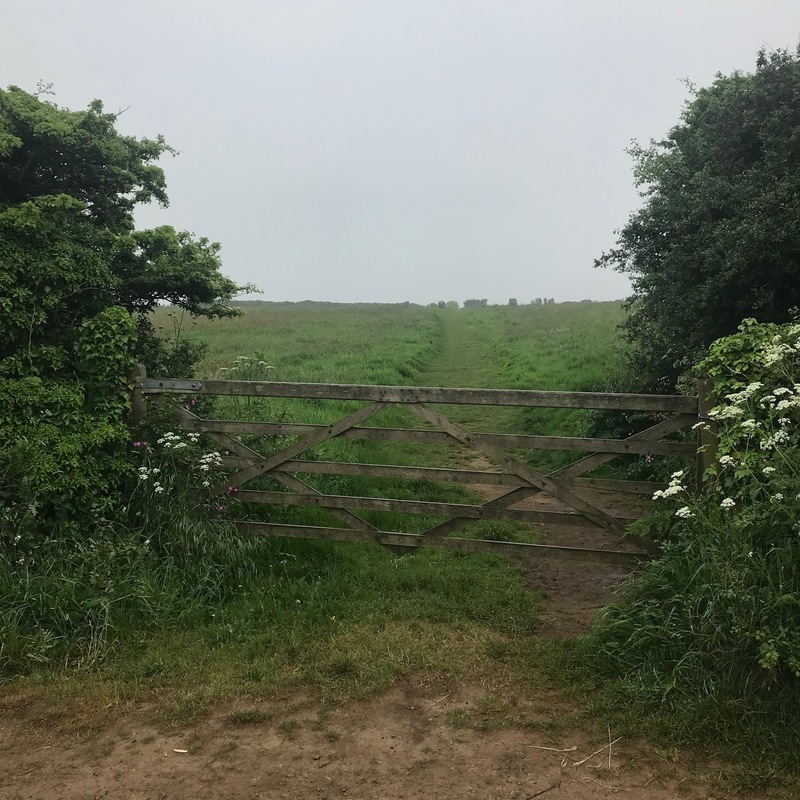 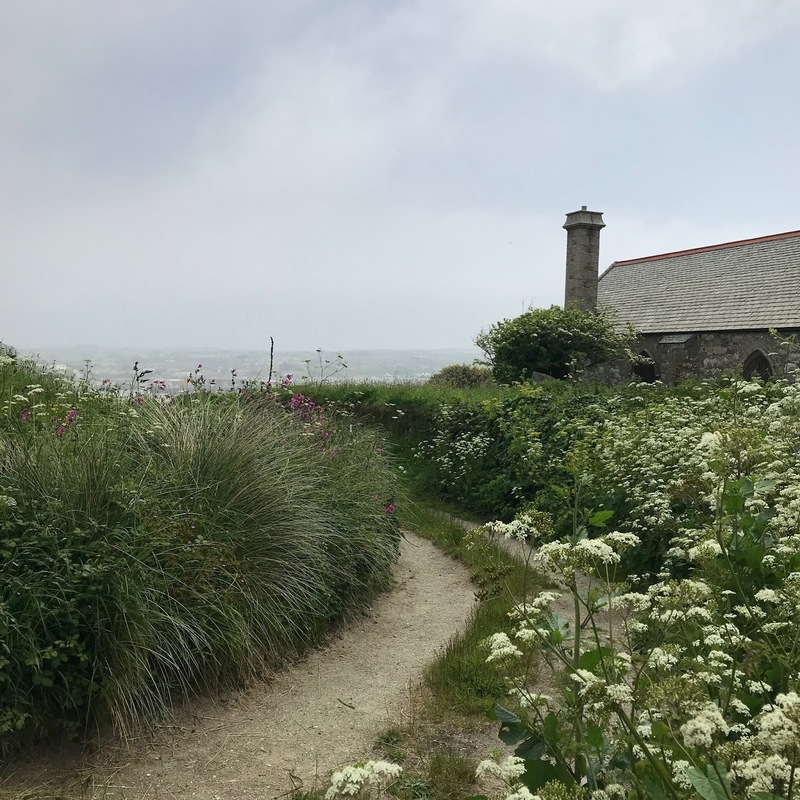 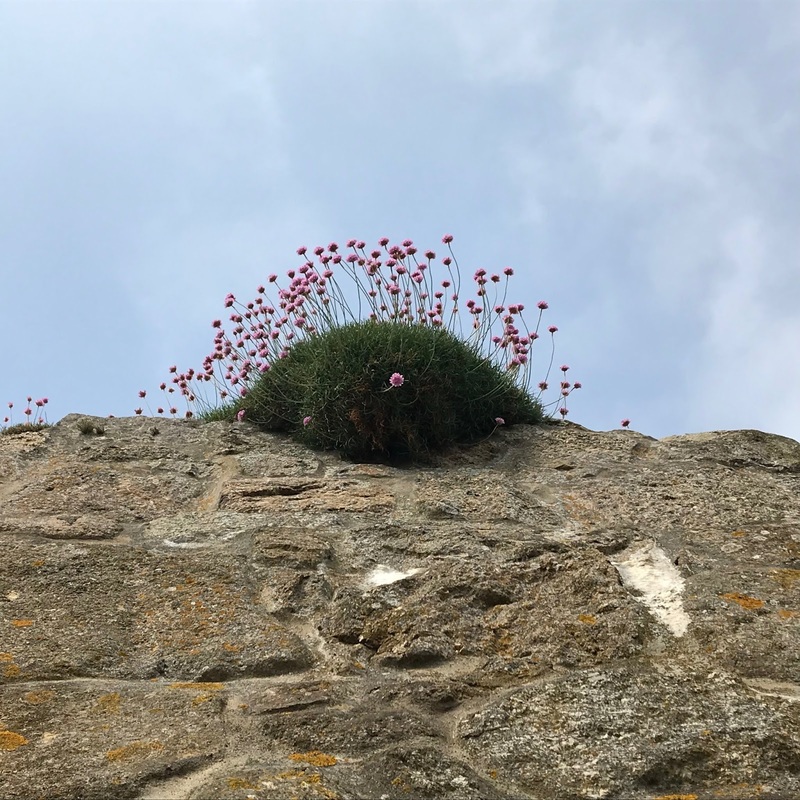 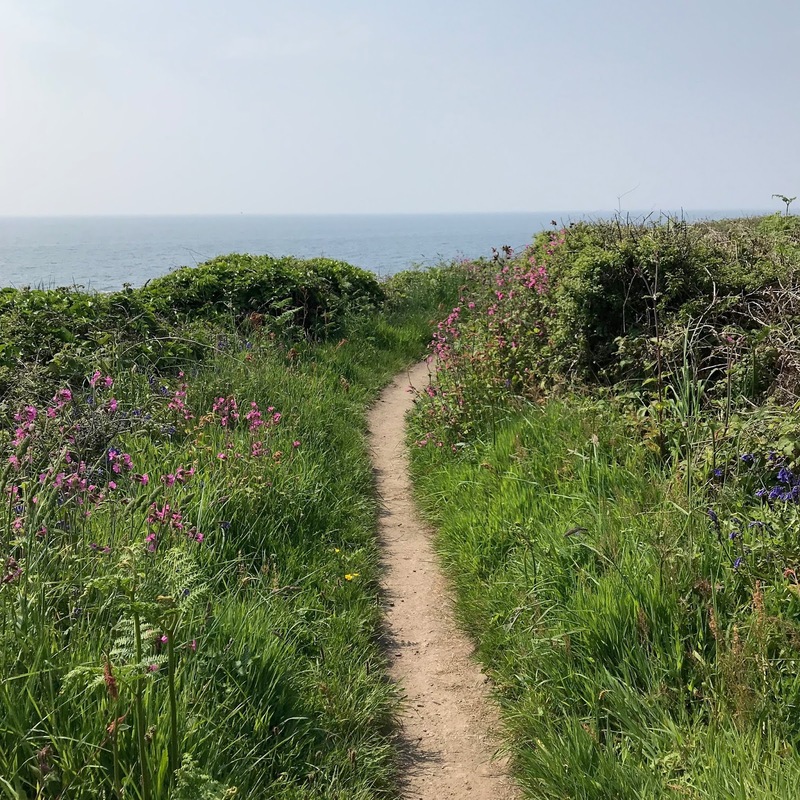 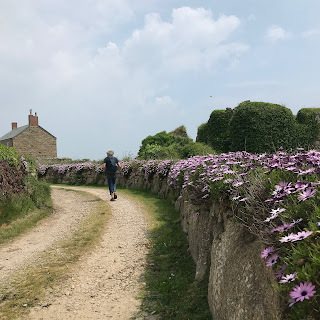 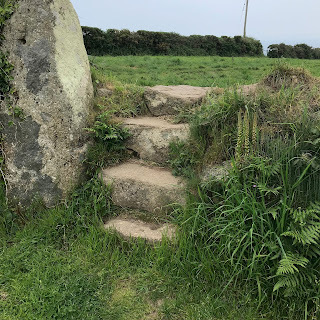 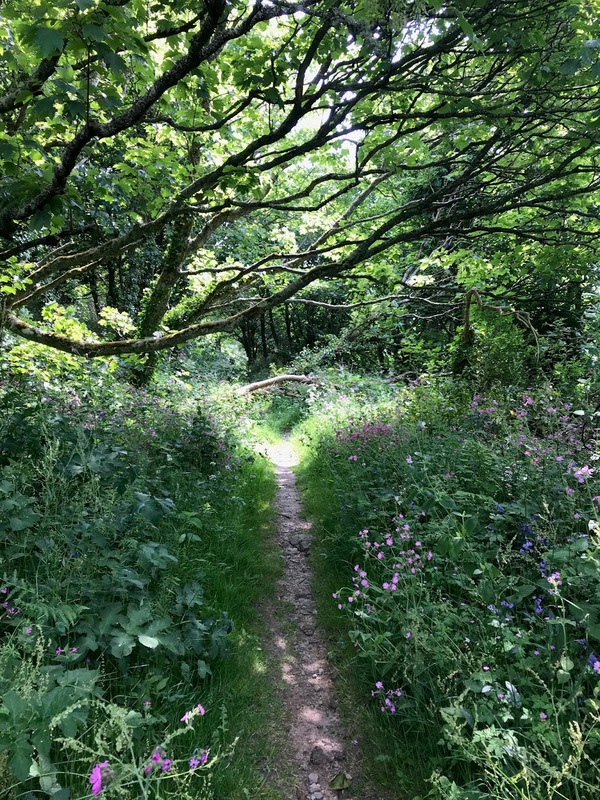 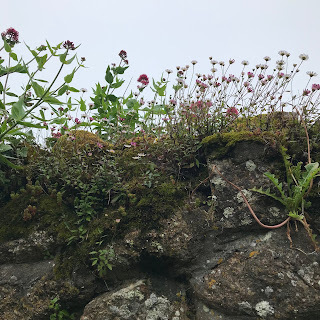 Above: Pictures from the walk to Lamorna. 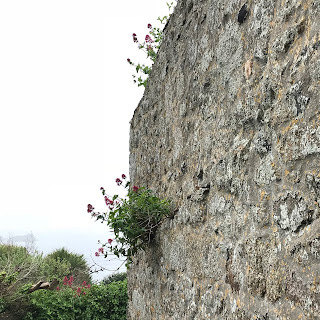 Lunch around the corner at a place along the harbor. 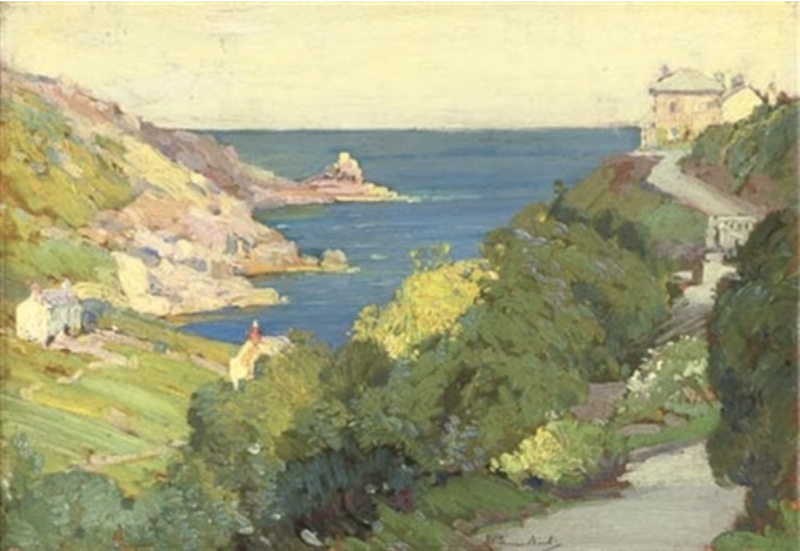 Above: The North Wind, Lamorna, by Samuel Hohn Lamorna Birch (1869-1955). 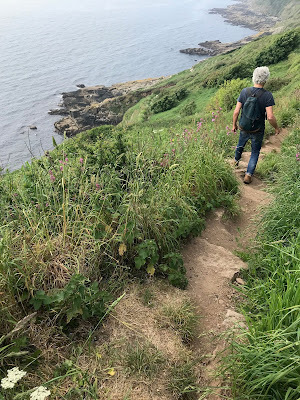 Below: On the way back to Mousehole we decided to go by public footpaths instead of the coast route. 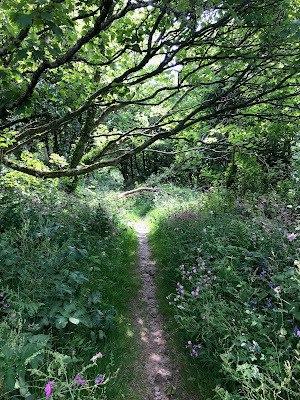 This was a picturesque route through a wood, across cow pastures, along dirt roads, and over stiles. Above: On the way to Cornwall we stopped in Dorset to visit Flora Roberts who was having a show there. 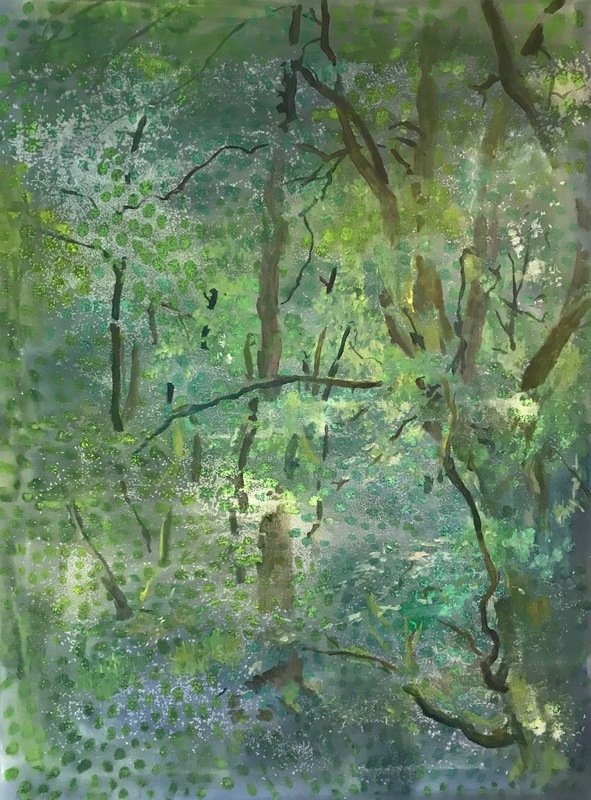 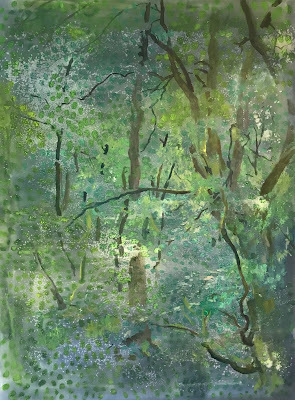 When we were walking in the woods I thought of this painting of hers. 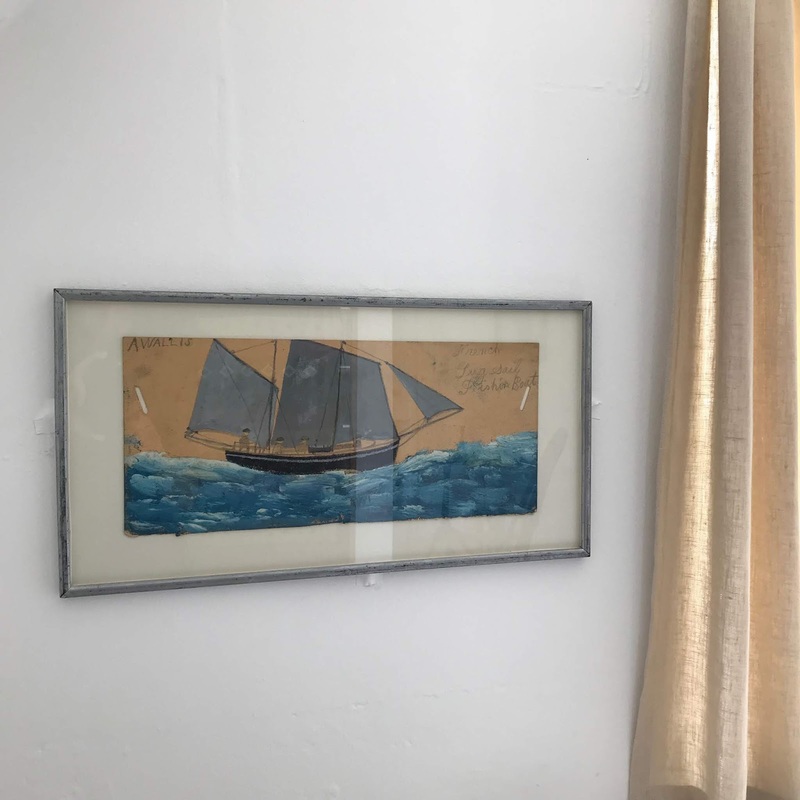 Above: Table in our apartment facing the harbor. Above: A drawing of Mousehole in Steven's sketchbook. 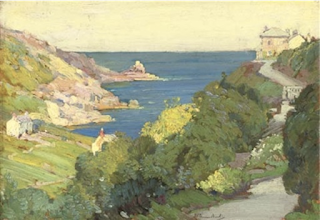 Above: William J. George (1851-1945), View from Raginnis Hill. 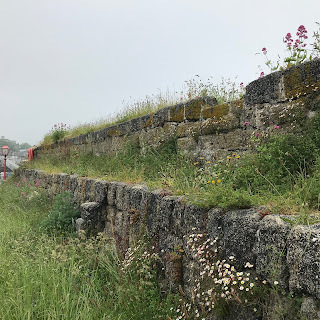 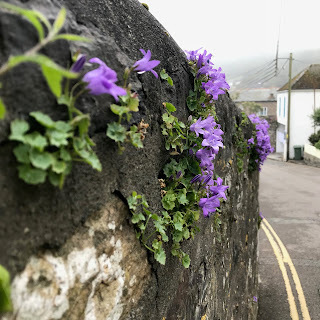 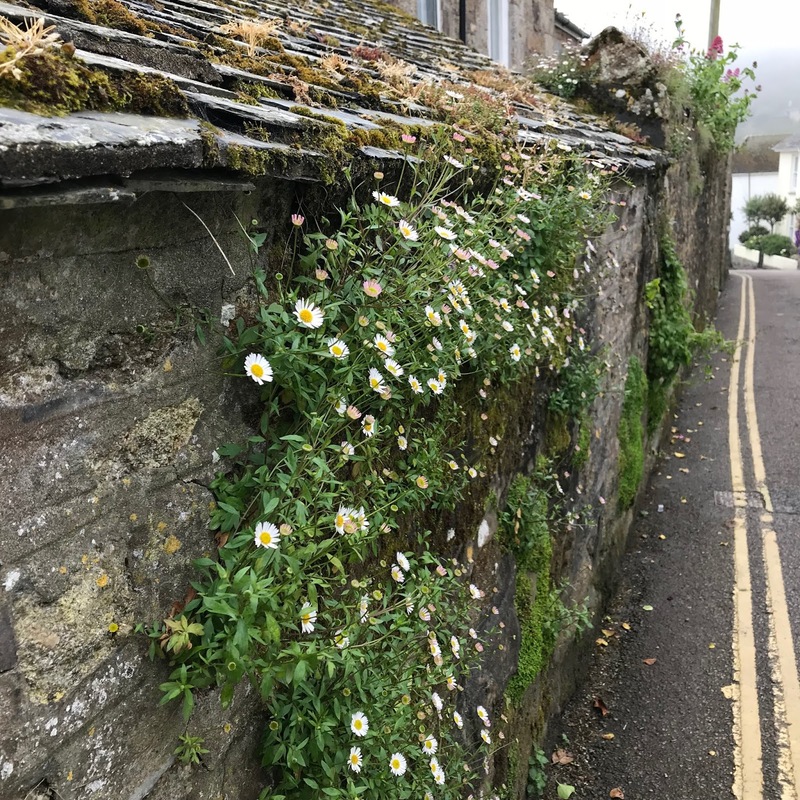 In late May (when we were there), flowers explode out of the walls. 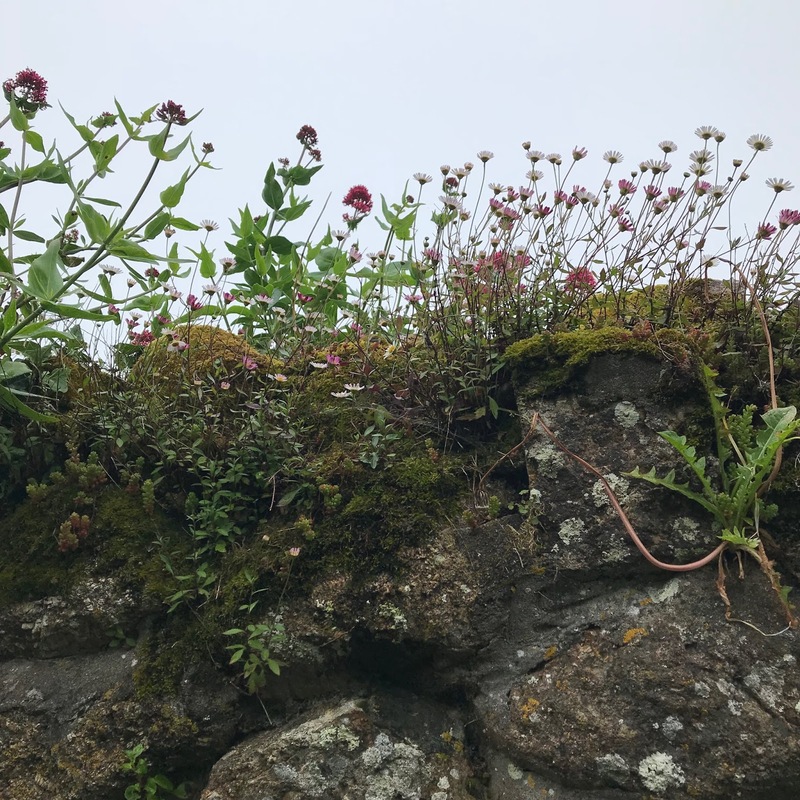 The frequent light rains and moisture in the air makes every surface feel alive. 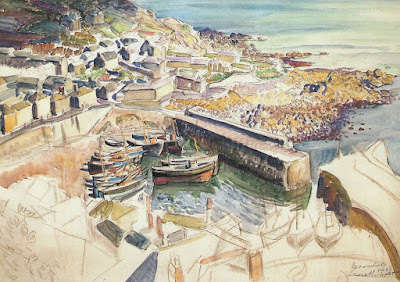 Below: Heading north along Mount's Bay takes you to Newlyn. 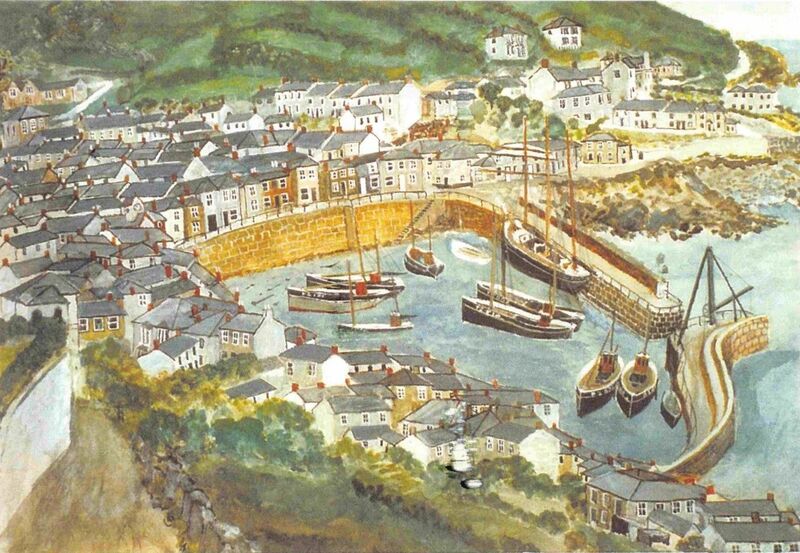 It's an old port, still a working fishing town. 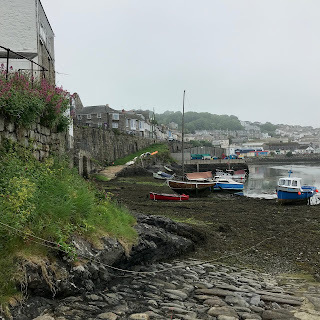 It's about half an hour walk from Mousehole along the water. 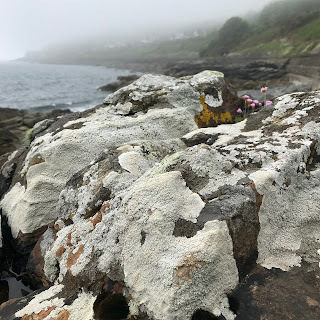 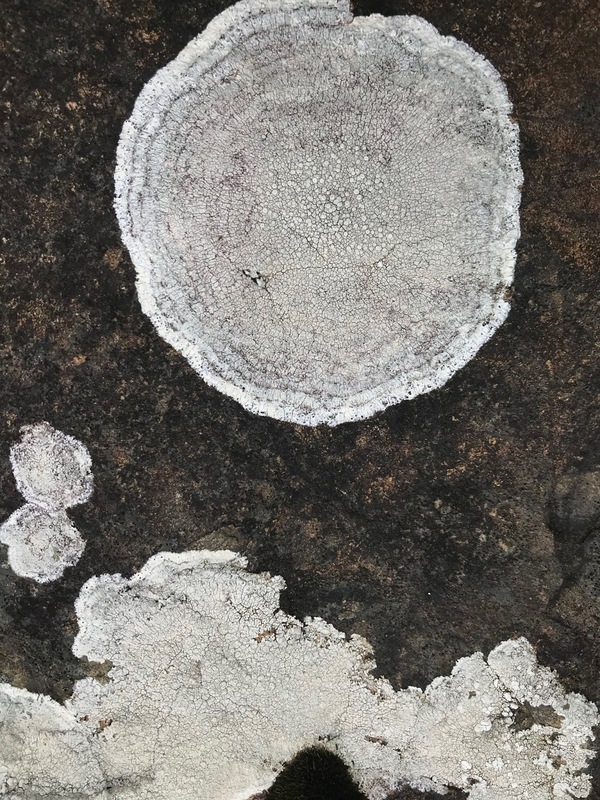 Above and below: White lichen on the rocks on the Mount's Bay shore. Above and below: You can see the old sea wall in the watercolor above from the 1930s. 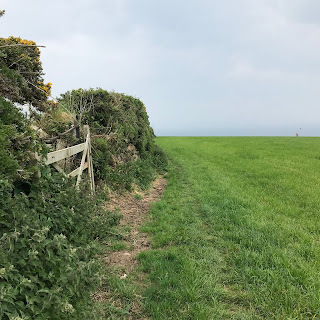 You can see it in the photo below now overgrown with grass and flowers. 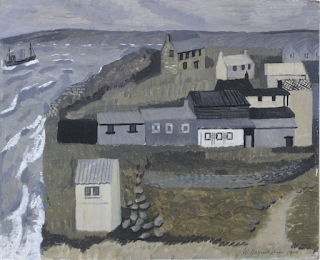 Above: Alfred Wallis (1855-1942), Newlyn. A favorite restaurant, Mackerel Sky, in Newlyn, on the side of a canal. Above: Boase Street in Newlyn. Above: Stanhope Forbes (1857-1947), Trewarveneth Street, Newlyn. 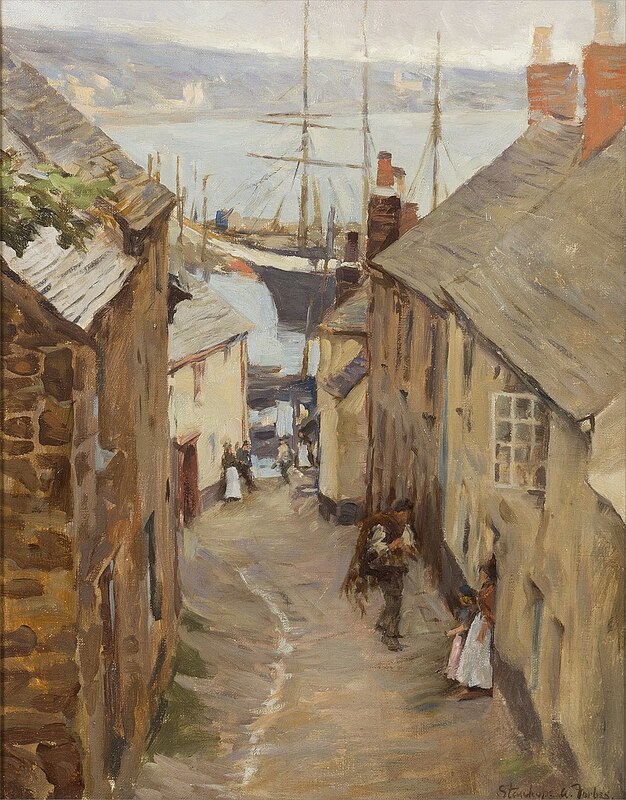 Stanhope is considered the father of the Newlyn School, a group of artists working from the 1880s to the early 20th century. 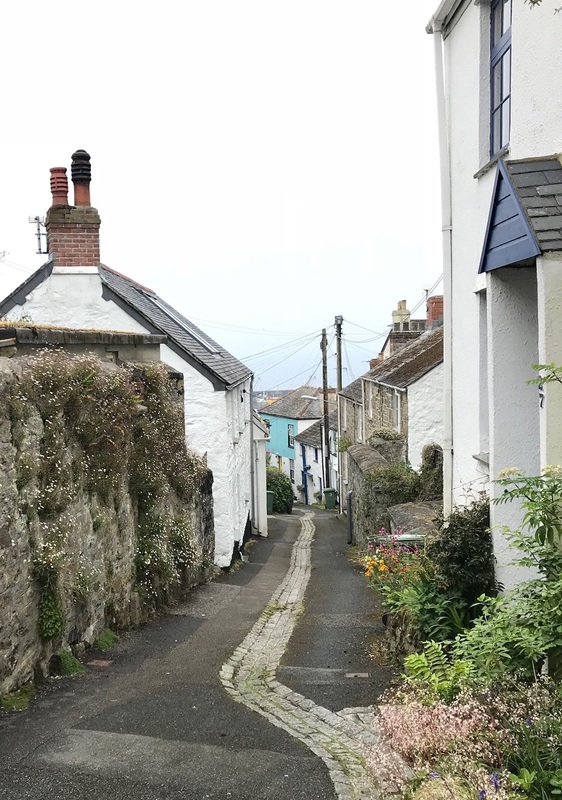 This street is just one block north of the street in the photo above. 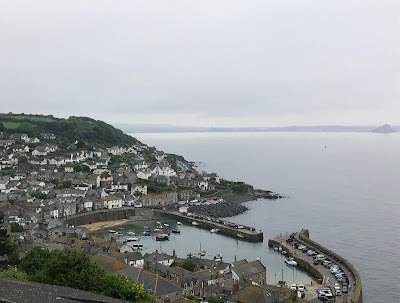 Just northeast of Newlyn along the bay you come to the larger town of Penzance. 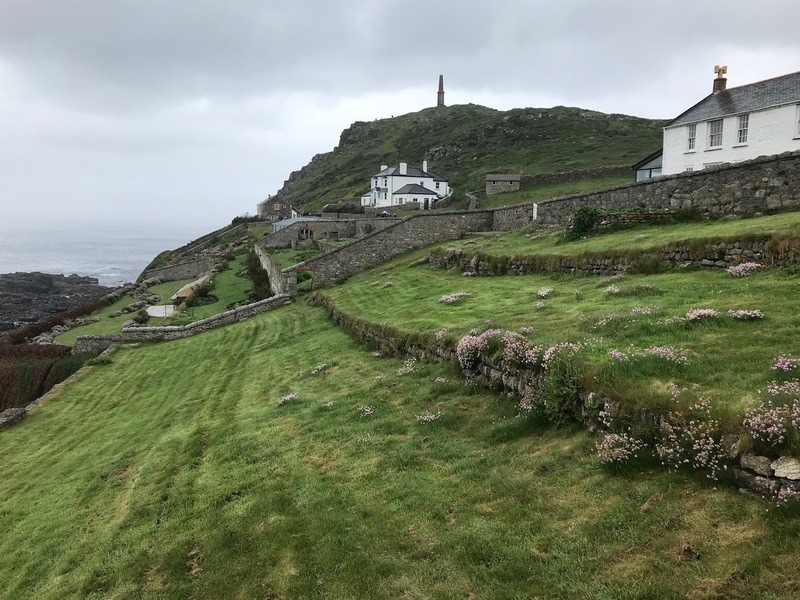 It is THE Penzance from Gilbert and Sullivan's comic opera The Pirates of Penzance. This is the farthest west stop of the train line from London. 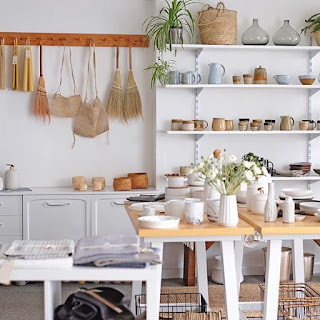 Some of the more interesting places there are Penlee House, which has a comprehensive collection of Newlyn School paintings, Barton's Books, an art book store with a great selection of local interest, and a very appealing home goods store called 56 on Chapel Street. 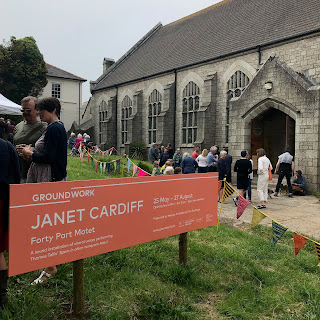 The day we were there a sound installation piece by Janet Cardiff was placed in Richmond Chapel, as an off site exhibit of the Newlyn Gallery, a contemporary gallery in Newlyn. 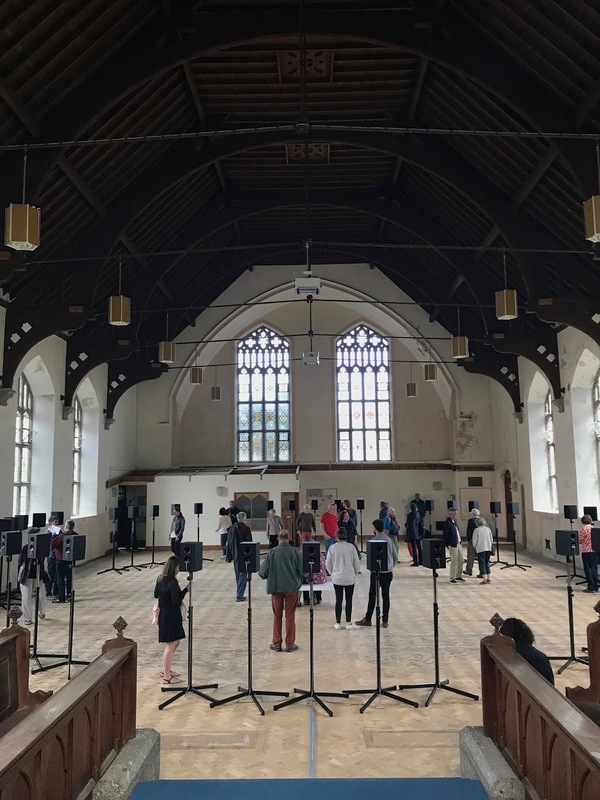 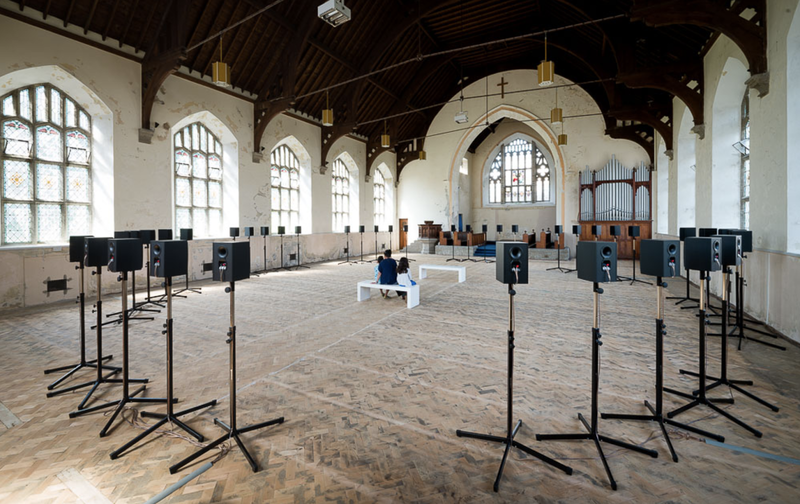 Above and below: Set in an unused chapel, usually closed to the public, is Janet Cardiff's sound installation "40 Part Motet". Above: Barton Books, near the top of Causewayhead in Penzance. 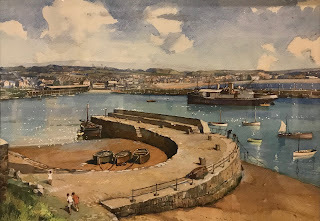 We bought a stack of books here, and had them waiting for us when we got home...Edward Bawden, A vintage travel book, an old wildflower book, and a monograph on Rose Hilton, an artist who'd been married to Roger Hilton and still lives in Newlyn. 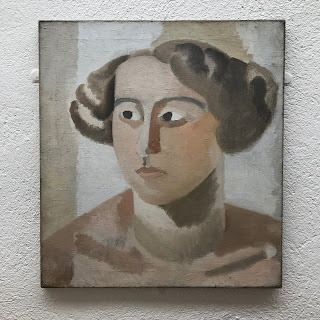 When we were in London we had a chance to see her show at Messum's on Cork St. 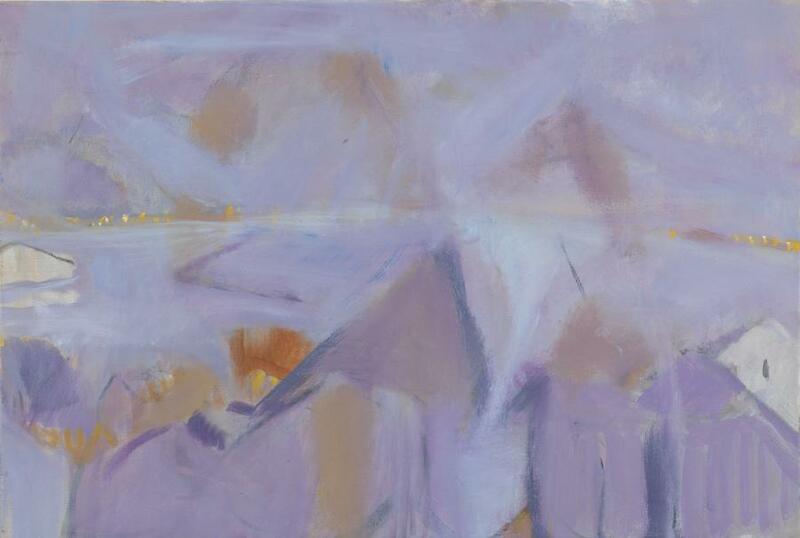 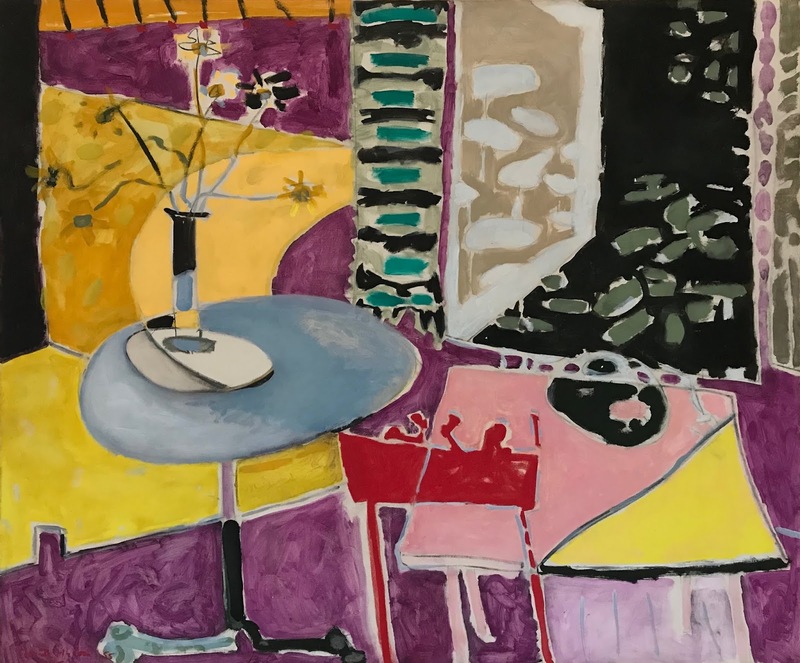 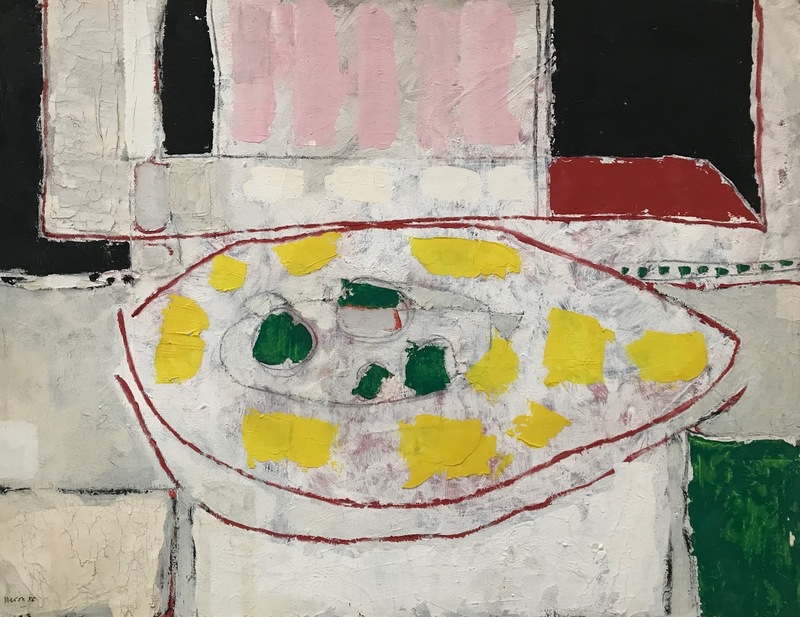 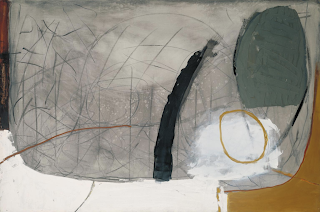 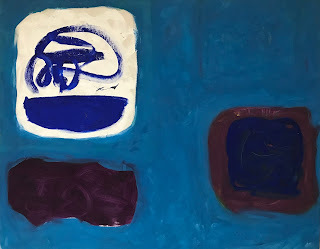 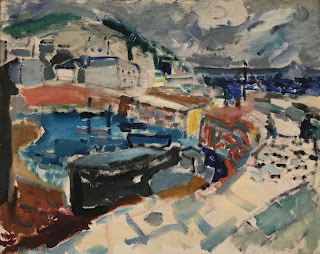 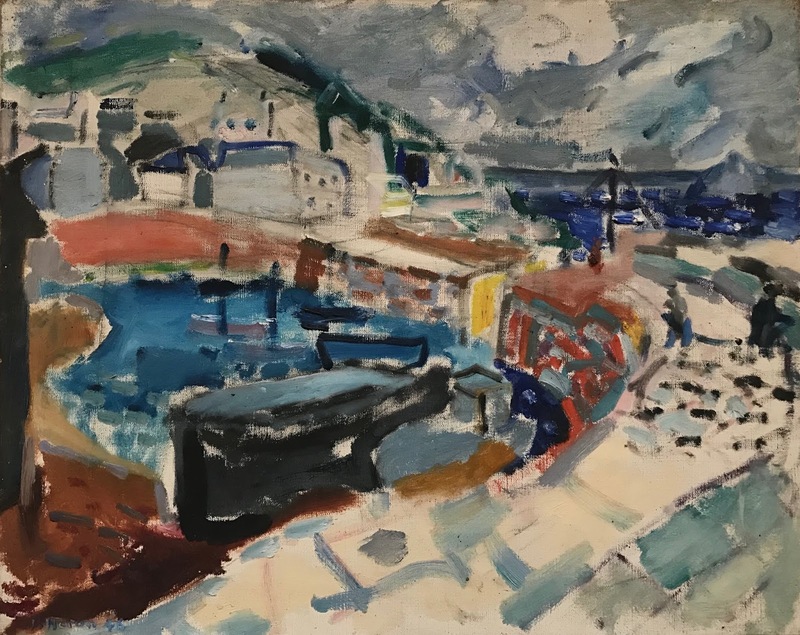 Though she'd been trained as an artist at the Royal College of Art, it wasn't until Roger Hilton passed away that she was able to take time to paint again. 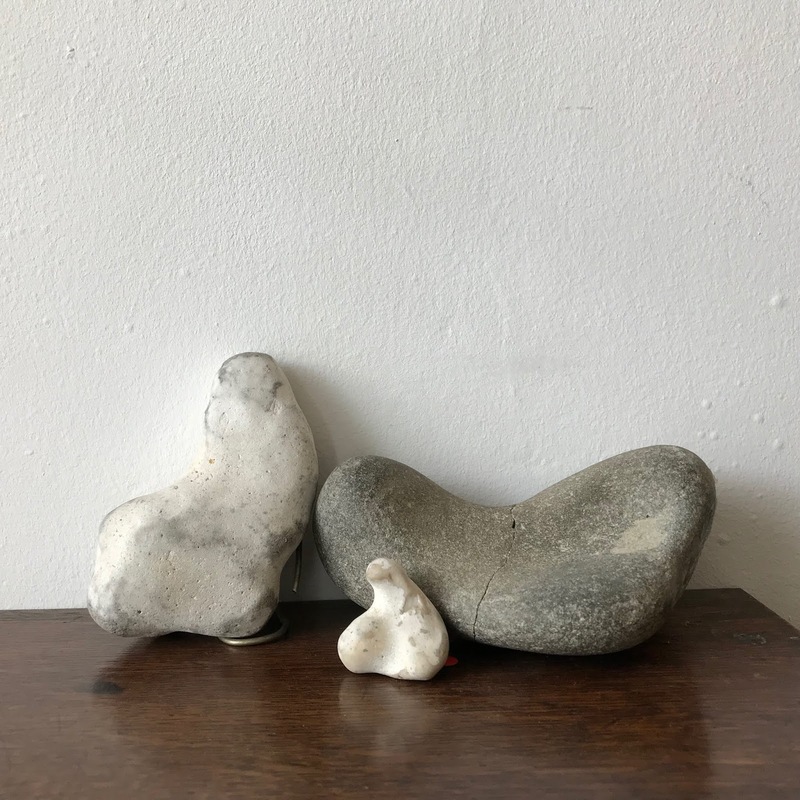 He felt that there could only be one artist in a family and she needed to take care of him and their children. But clearly much was waiting to come out once she had time to paint, and the show at Messum's was terrific. 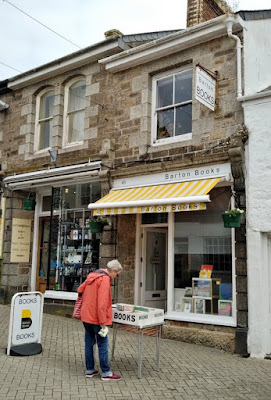 Above: 56, a store on Chapel Street, Penzance. 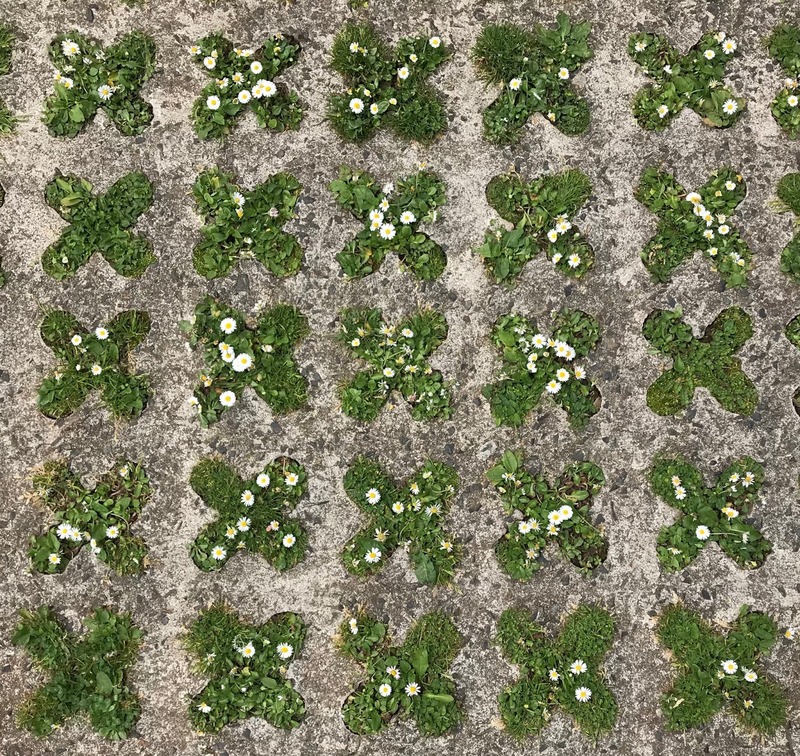 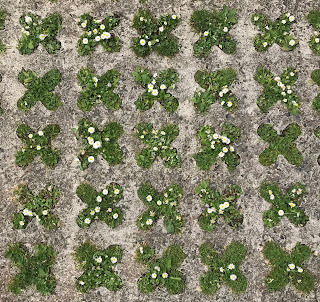 Above: Parking lot flower pattern. 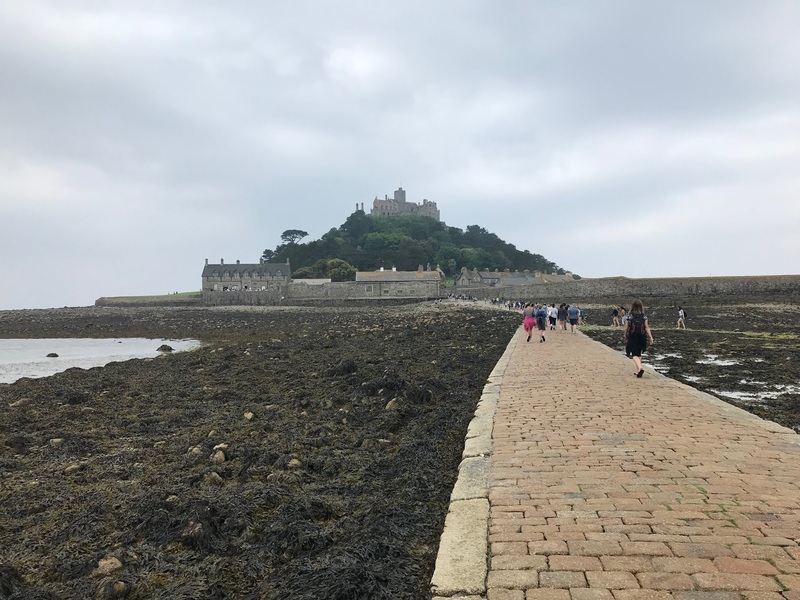 Above and below: St. Michael's Mount is an island in Mount's Bay outside Marazion, a town just east of Penzance. 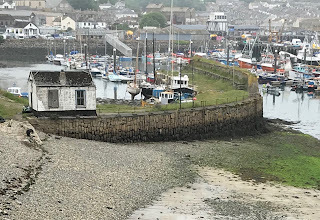 At high tide it's only accessible by boat, but at low tide you can walk there. The walk has been made easier by a paved path, but it's possible to get almost all the way there in the sand. 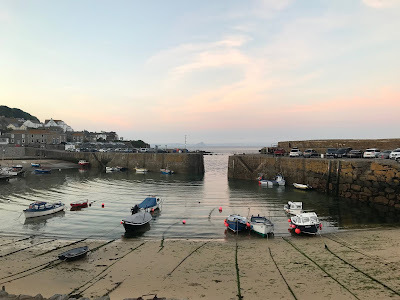 Above: Back to Mousehole end of day. You can just see St. Michael's Mount to the left of the seawall opening in the distance. At low tide you can see the ropes all pulled to the center by the outgoing tide. St. Ives sits on the northern coast of Cornwall, across the peninsula from Penzance. 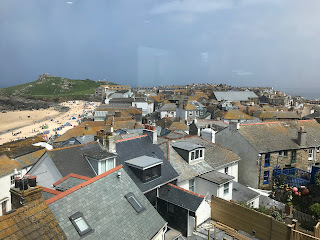 We drove to a nearby park and ride train stop, as parking in St. Ives is quite limited. We decided to walk there instead of taking the train both ways...it was a fantastic path. 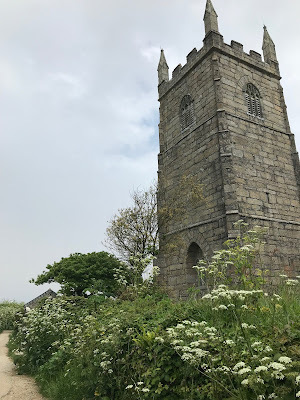 Above: Try to imagine that on this particular day there was a bell ringing celebration, so a lovely ringing sound was the soundtrack for the beginning of this walk. 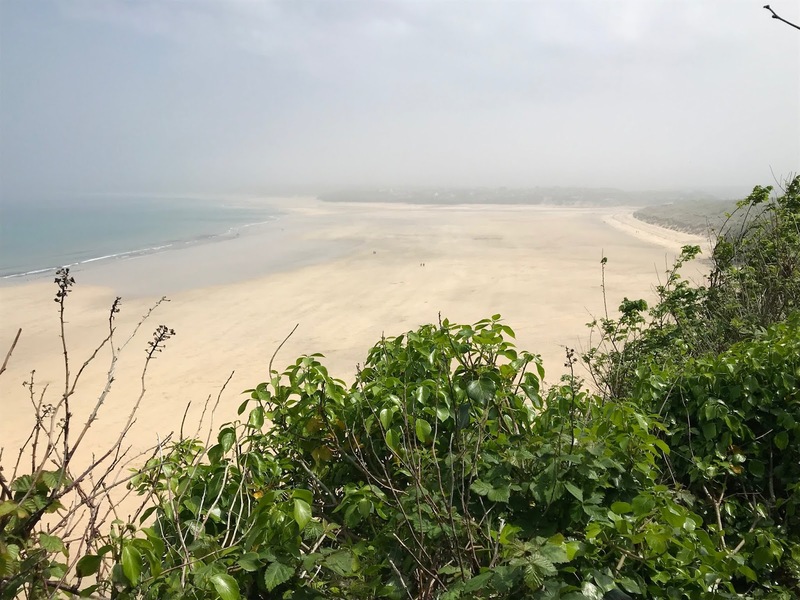 Above: This is the Hayle River estuary at low tide. At high tide the water quickly fills in a huge part of the sandy area, Porthkidney beach. 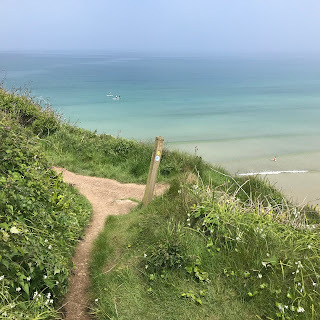 Above: The cliff path above St. Ives Bay. 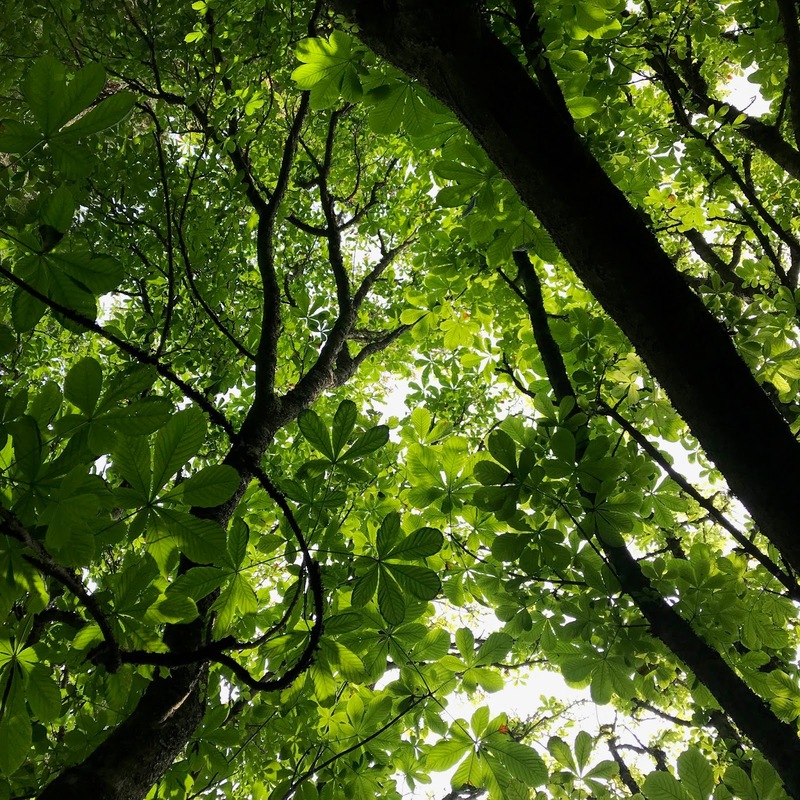 Above: The acorn is the symbol for the coast path...often the acorn is the only marking. 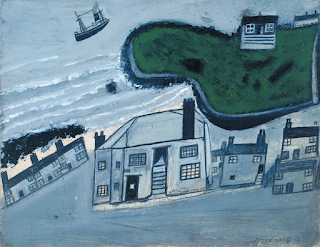 Above: Alfred Wallis (1855- 1942), The Hold House, Port Mear Square Island, Port Mear Square Beach, 1932. 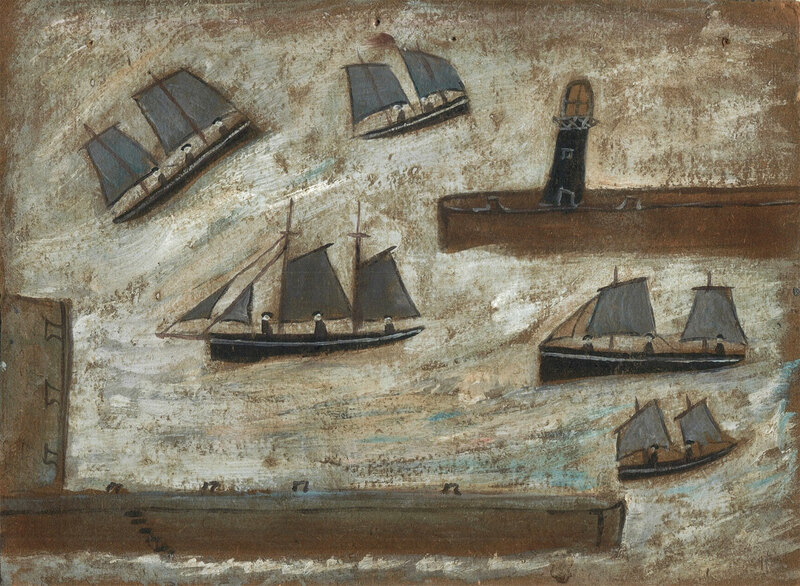 Alfred Wallis was a mariner and a scrap dealer who turned to painting in 1922 after the death of his wife. 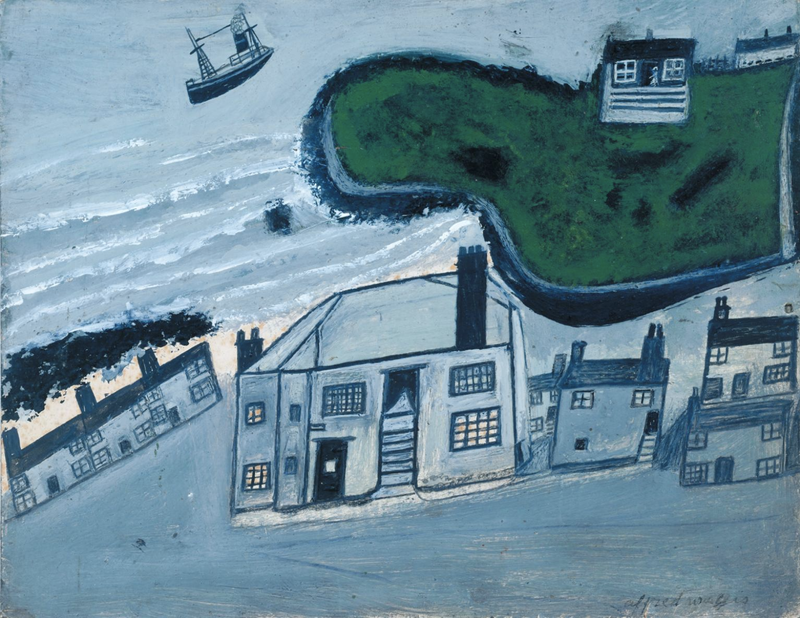 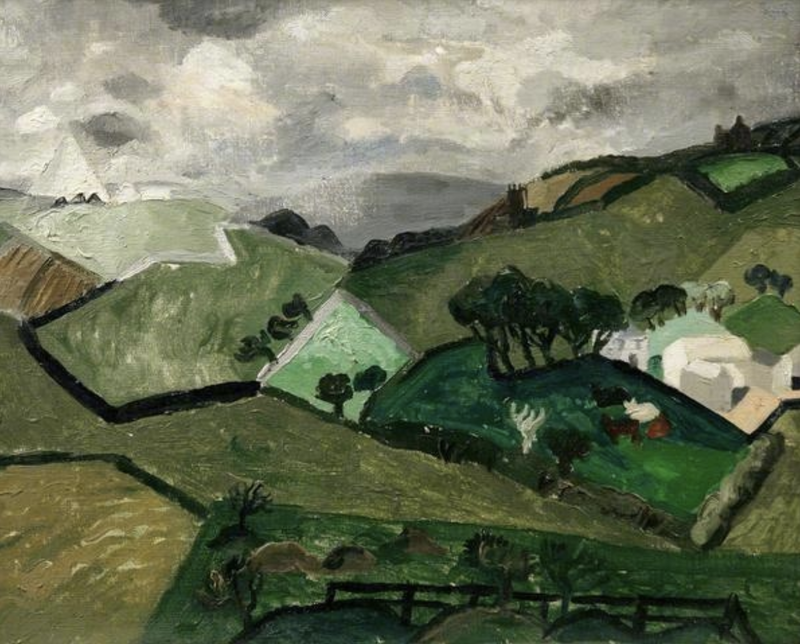 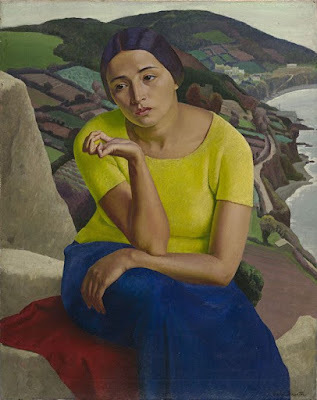 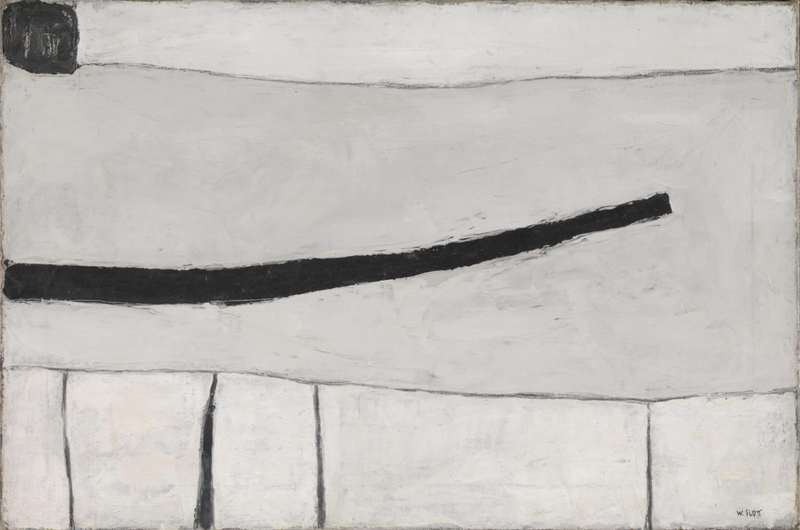 He was discovered by artists Ben Nicholson and Christopher Wood in 1928 when they moved to St. Ives to found an artist's colony. 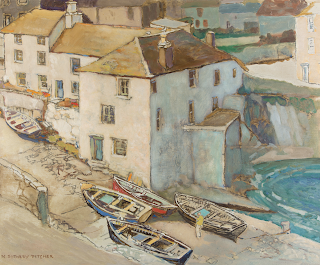 He became influential to many of the artists moving there at that time. 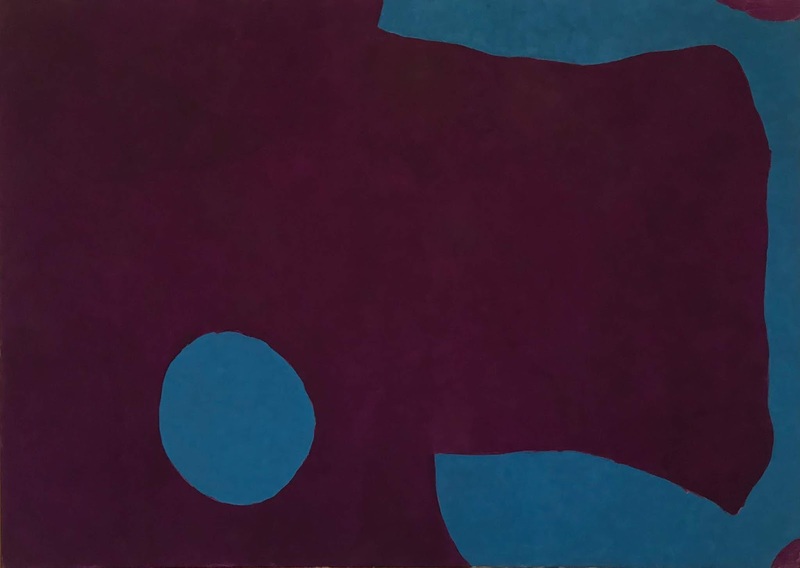 You can see his influence in the painting below by Wilhelmina Barns-Graham. 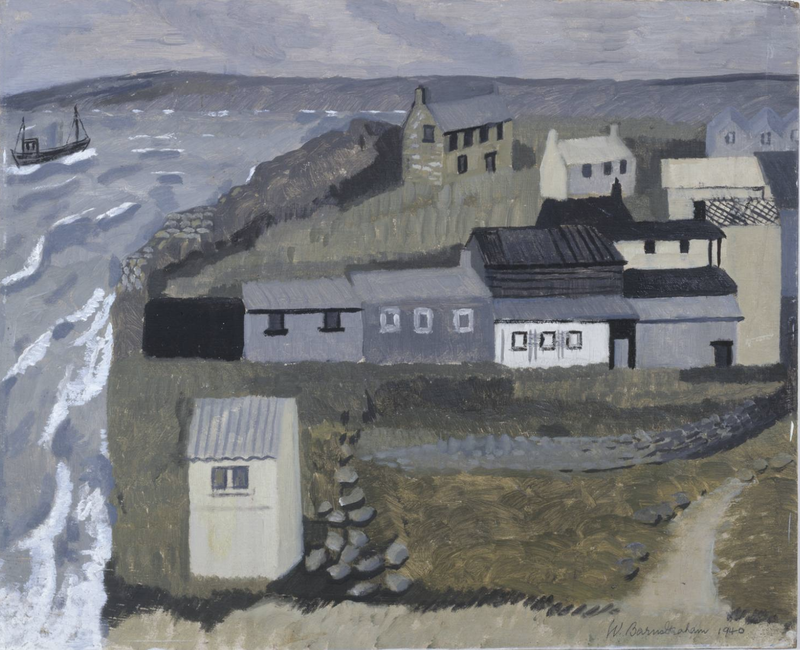 Above: Wilhelmina Barns-Graham, Island Sheds, St. Ives, No. 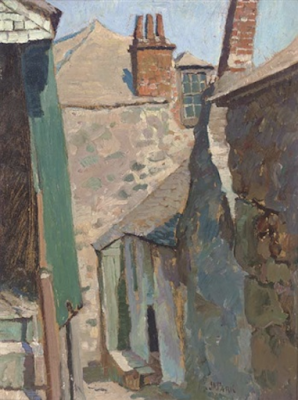 1, 1940. 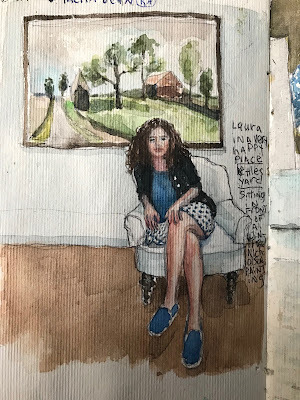 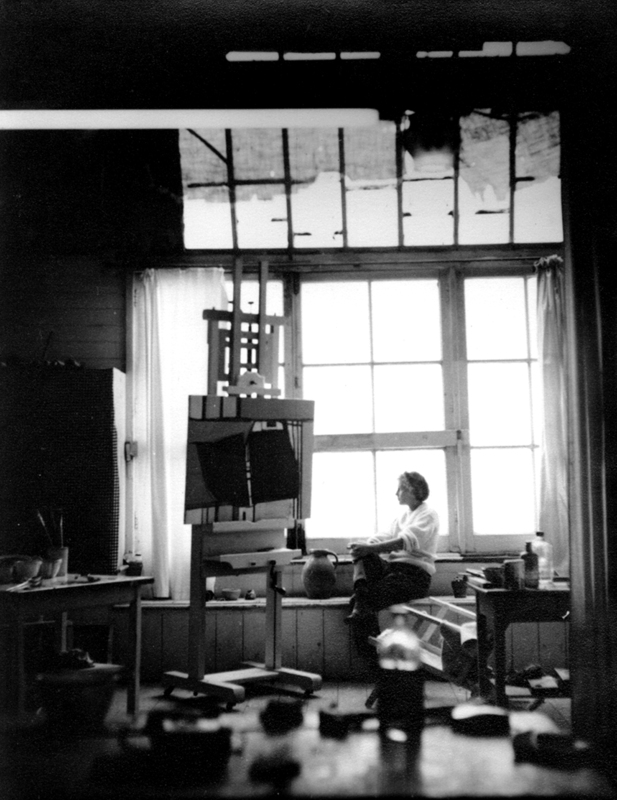 Below: Barns-Graham in her studio nearby. 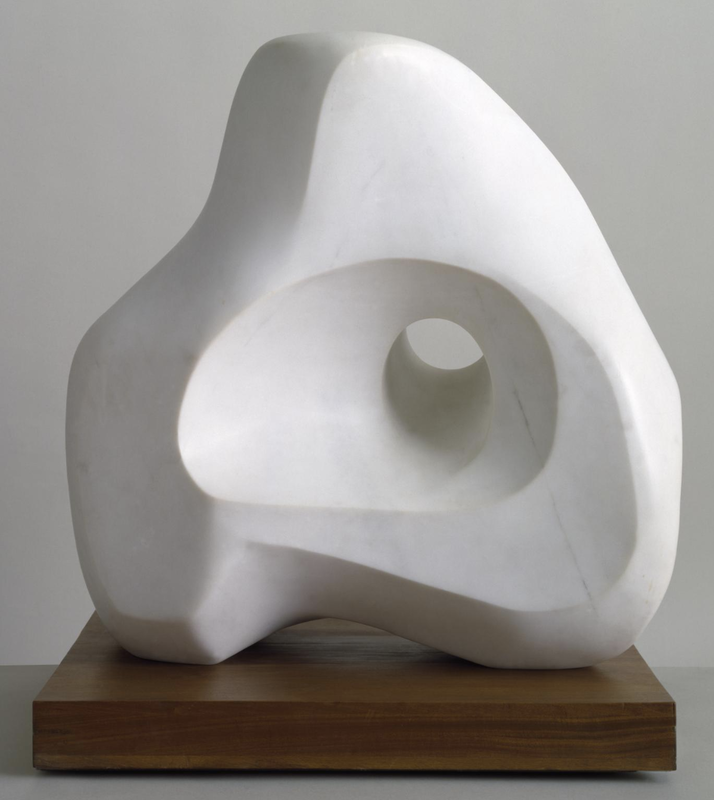 Not far from the Tate is Barbara Hepworth's studio, which is open to the public. 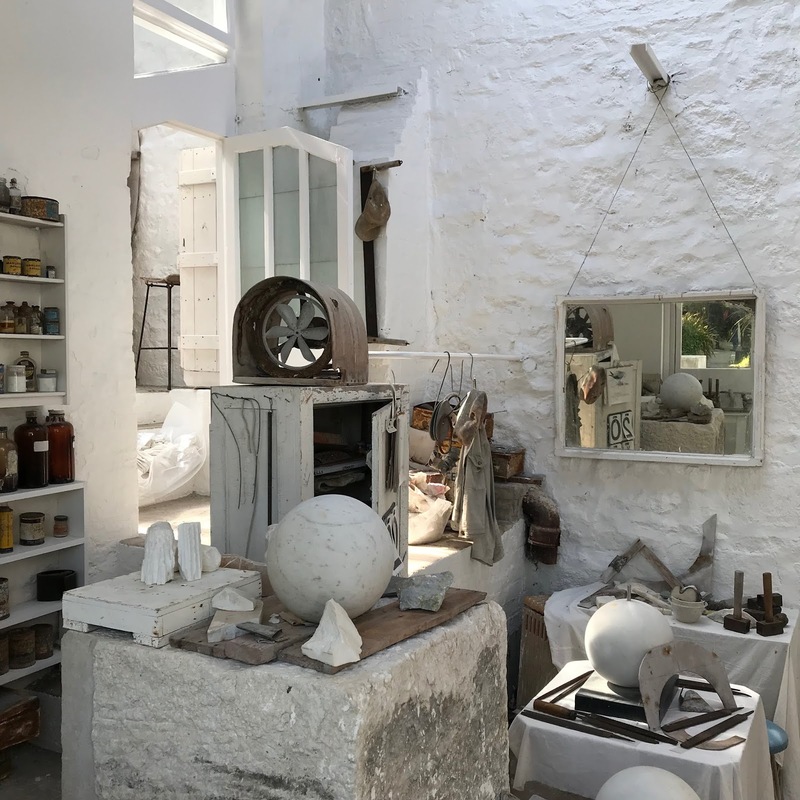 Above and below: Maquettes for larger projects and grinding tools and a sculpture not quite completed in Hepworth's studio. 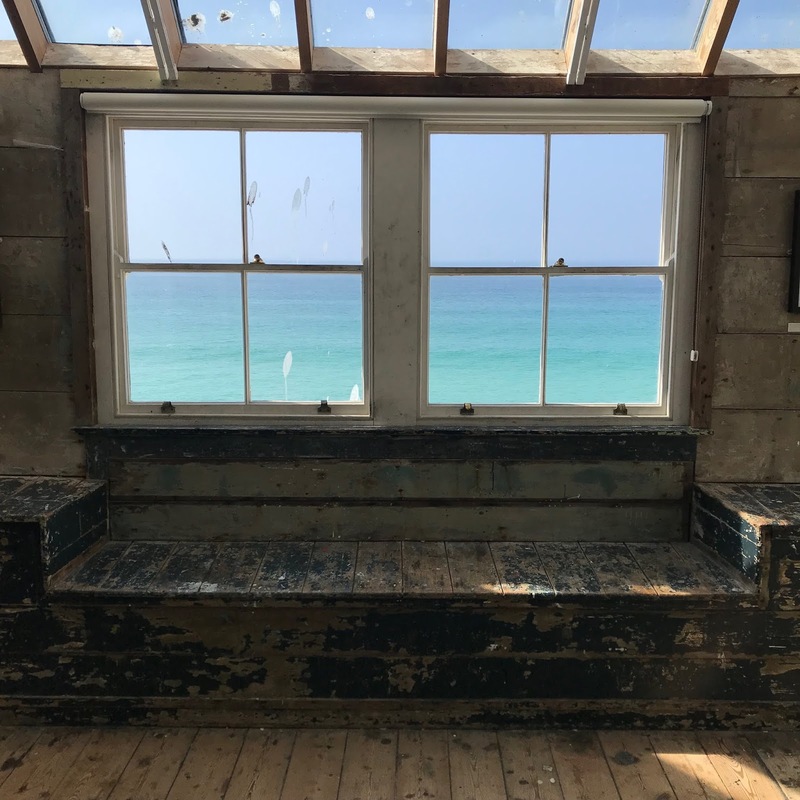 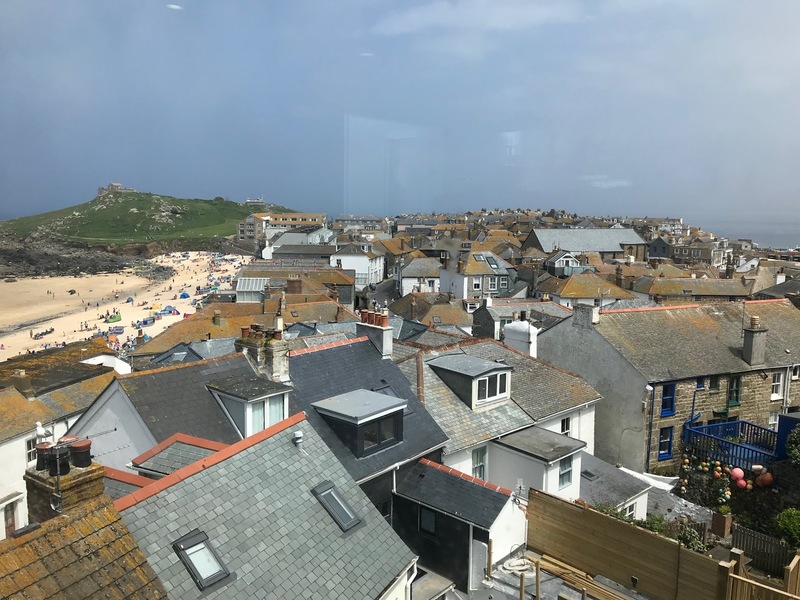 Above: The view from an art school in St. Ives. 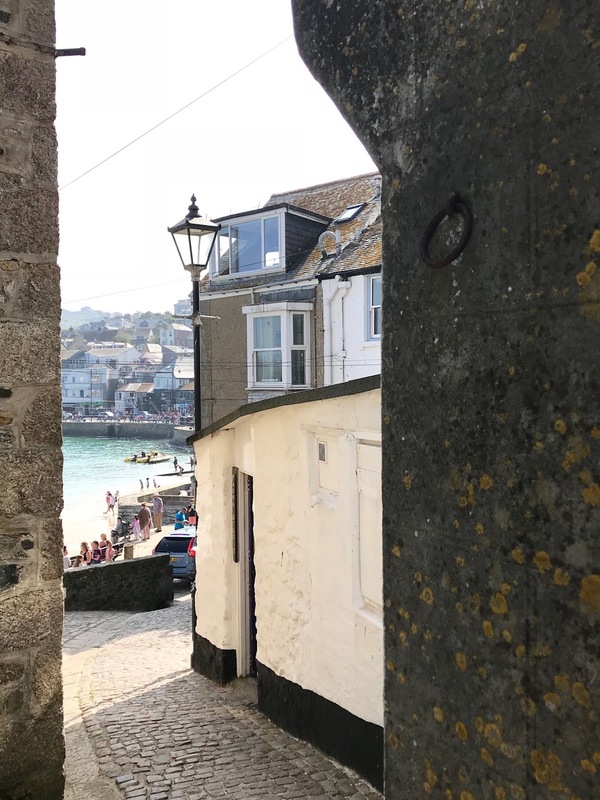 Above and below: Winding streets set the planes of each building at odd and interesting angles to each other. 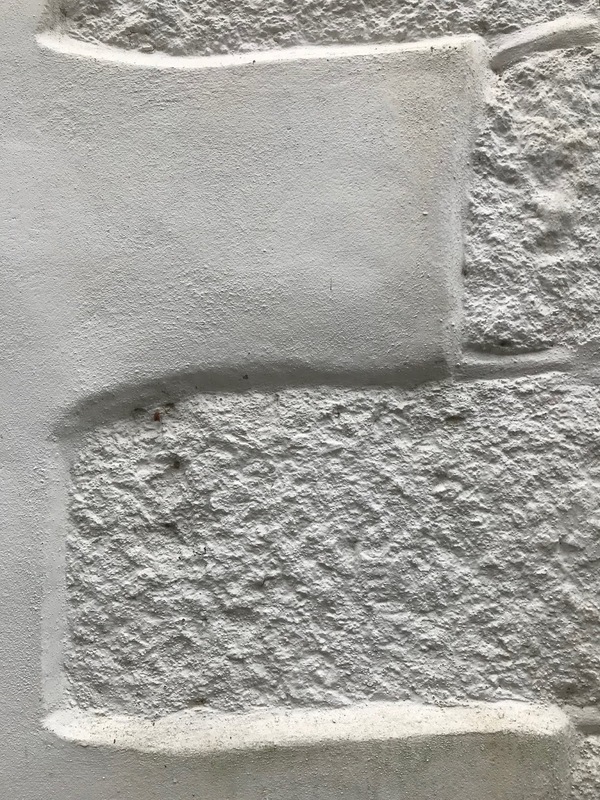 The contrast of stone and white plaster enhances the compositions. 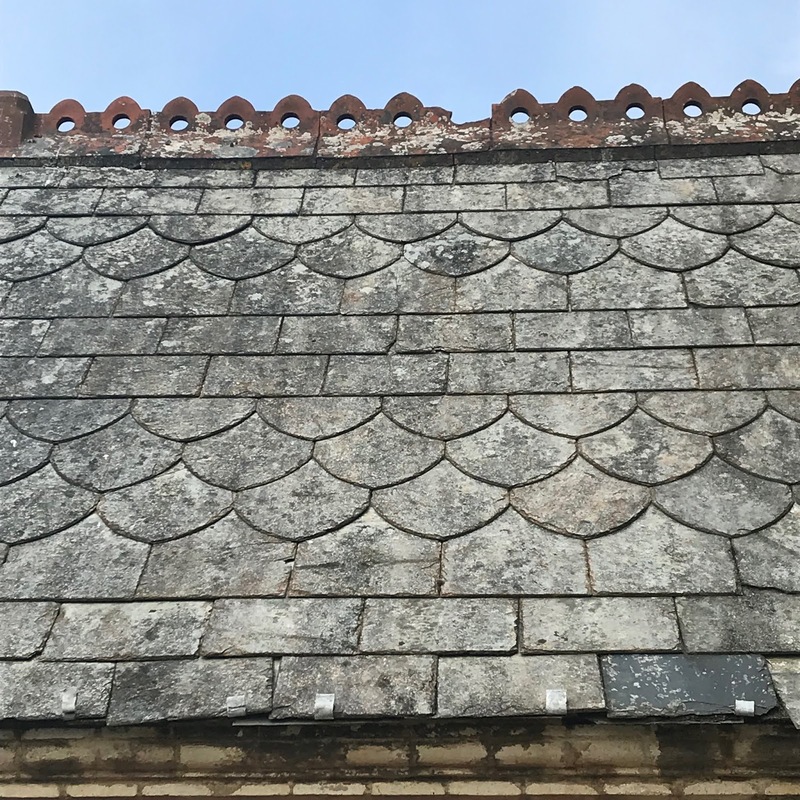 Above: Many roofs are detailed with terra cotta trim where the planes of slate meet. 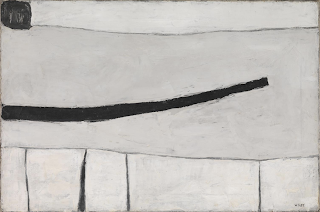 Above: Mount Zion Coffee is painted with a typical black border at the base. 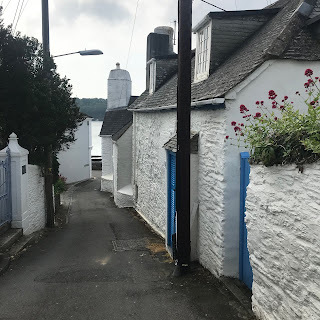 The day before we left Cornwall we spent driving around the west end of the peninsula. 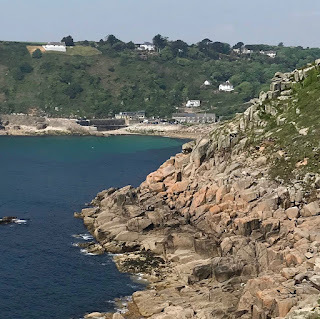 Above: In Cornwall in 1940 and 41 the military was actively engaged in building defenses against German attack, as the extensive coastline made it a target for invasion. 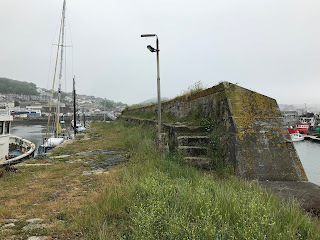 Thousands of these pillbox structures were created as lookout posts. Above: Christopher "Kit" Wood (1901-1930), Green Hills, 1930. 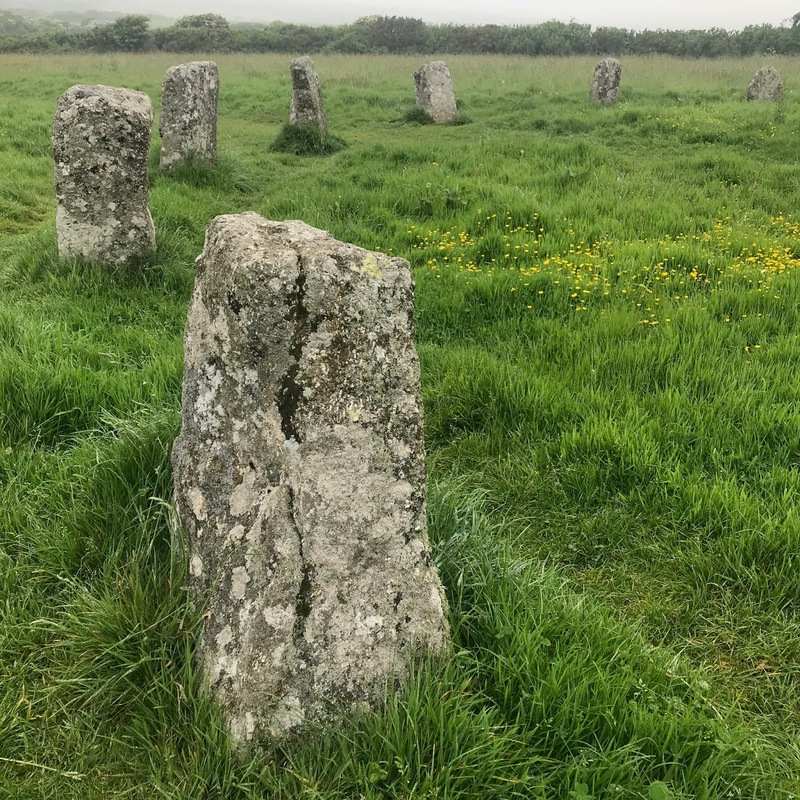 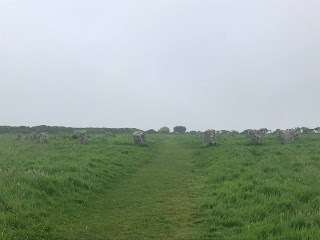 Above and below: You could almost miss this, but on the side of the road is an ancient ritual stone group named Merry Maidens. 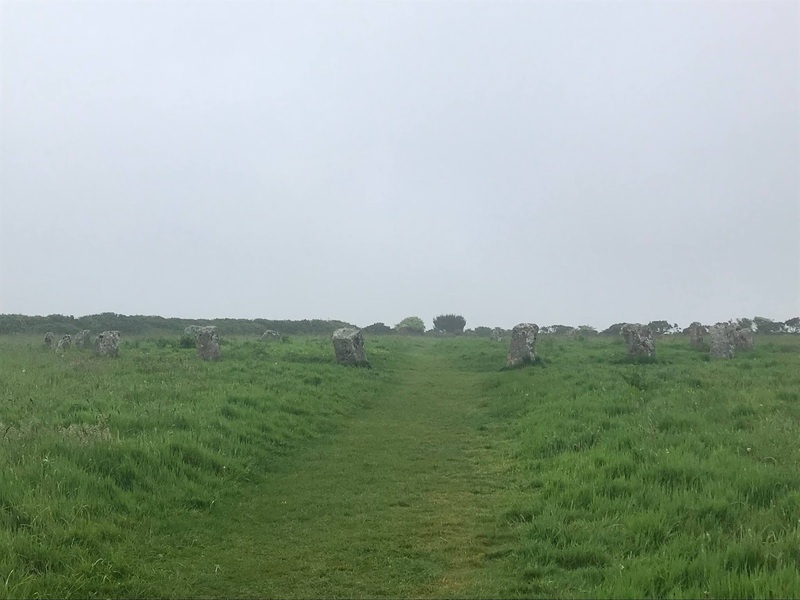 Like coming across a small Stonehenge with no one there but us. The stones are about four feet high. Above: A duck pond on the roadside. Above: Directions written in rock. Above: End of a misty day. 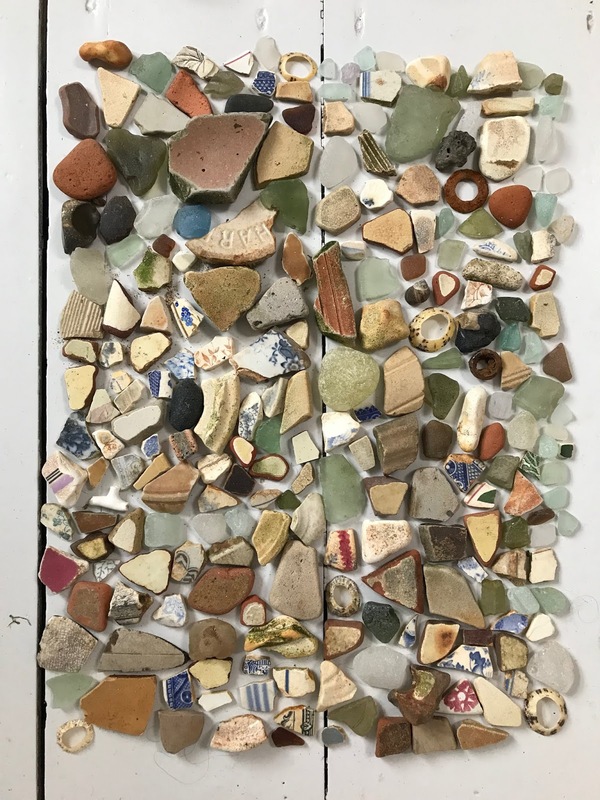 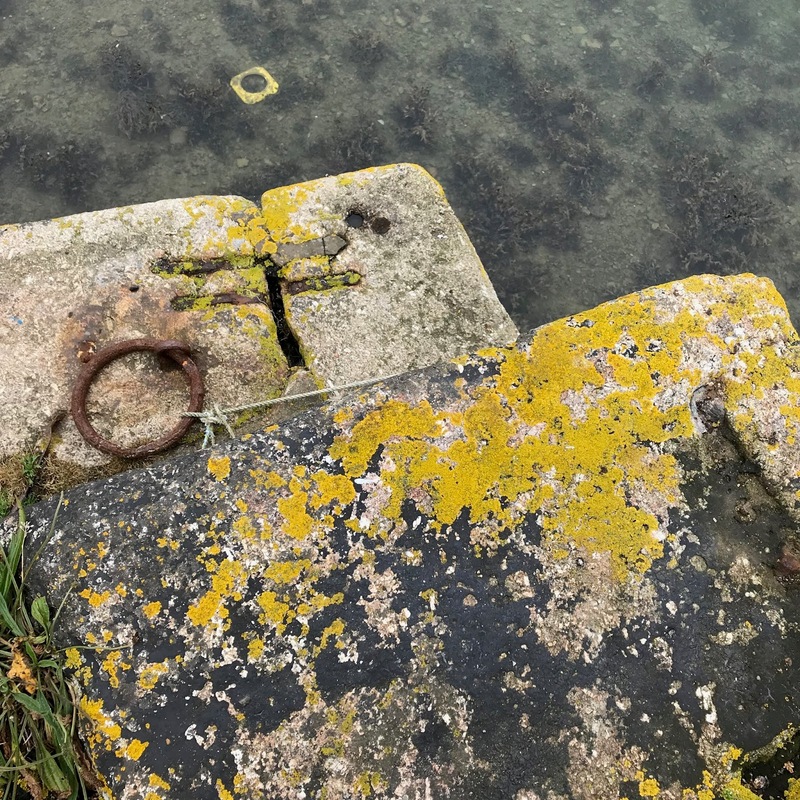 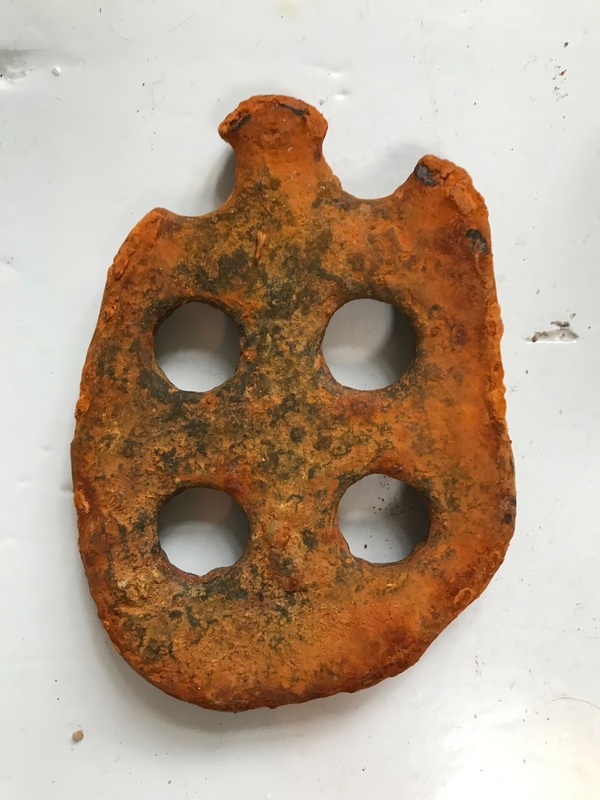 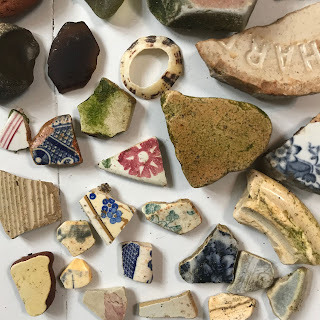 Above and below: Week's mudlarking collection. 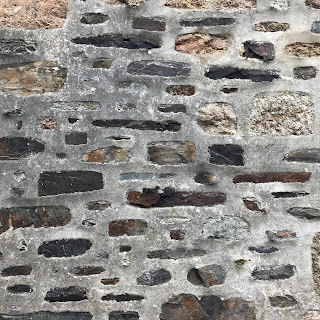 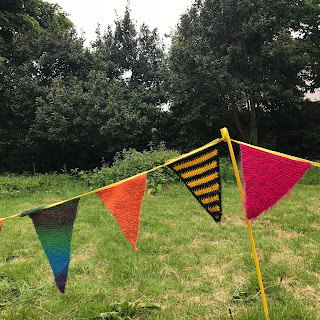 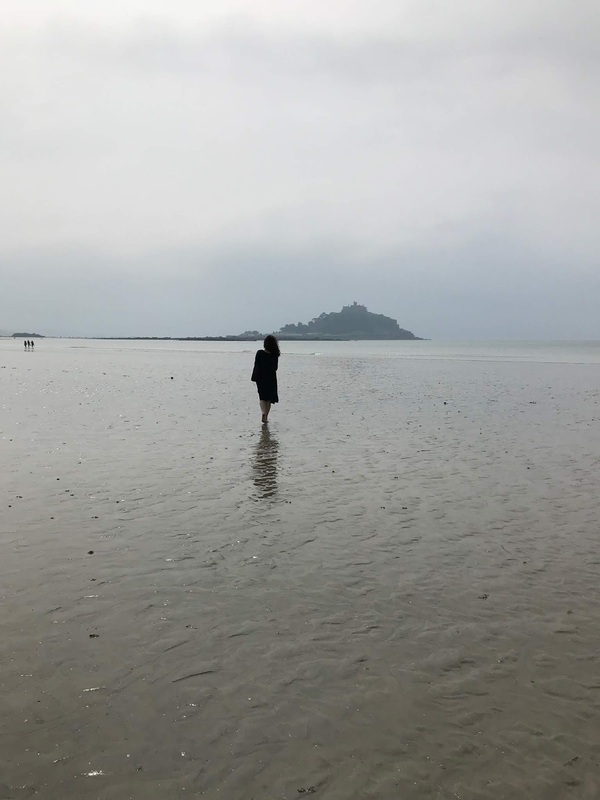 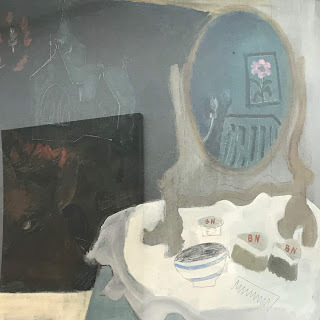 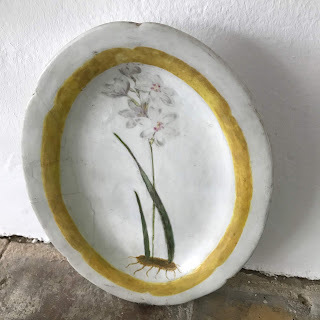 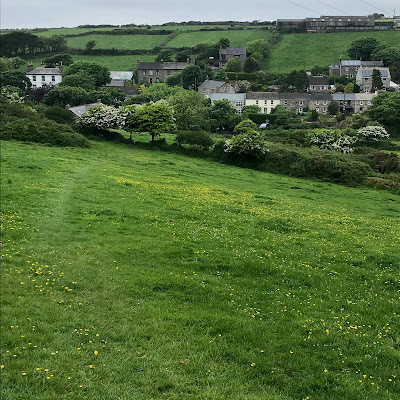 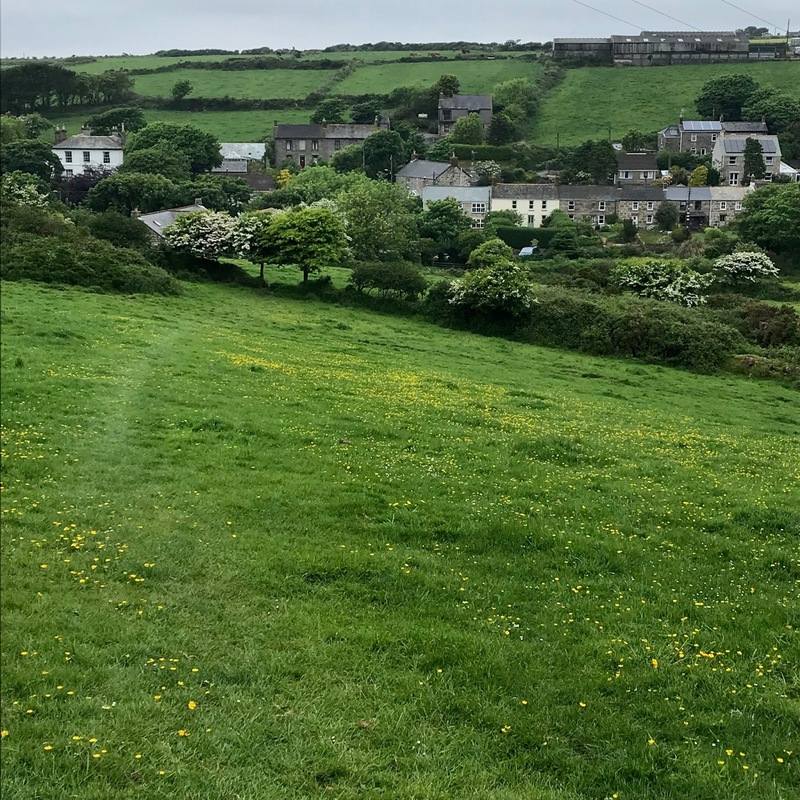 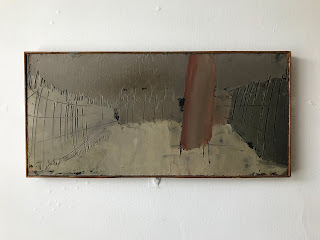 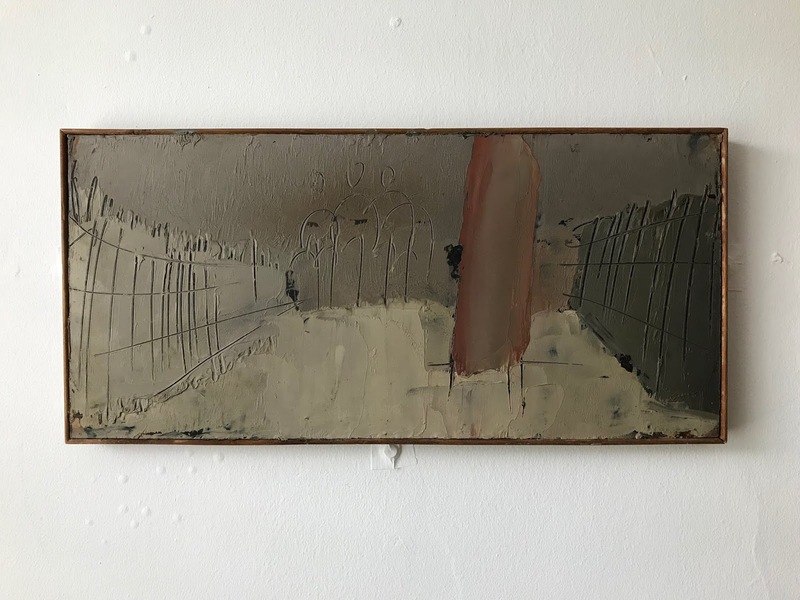 I've chosen to put West Cornwall and Kettle's Yard together because there's an overlap in the sensibility of the places and of the artists who form a part of St. Ives and Kettles Yard. 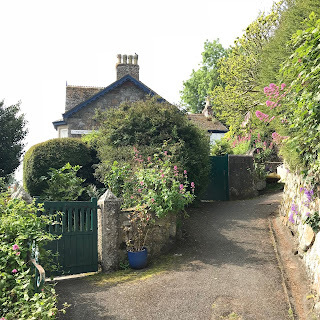 This house museum was conceived of and arranged by Jim and Helen Ede, who lived here for 15 years. 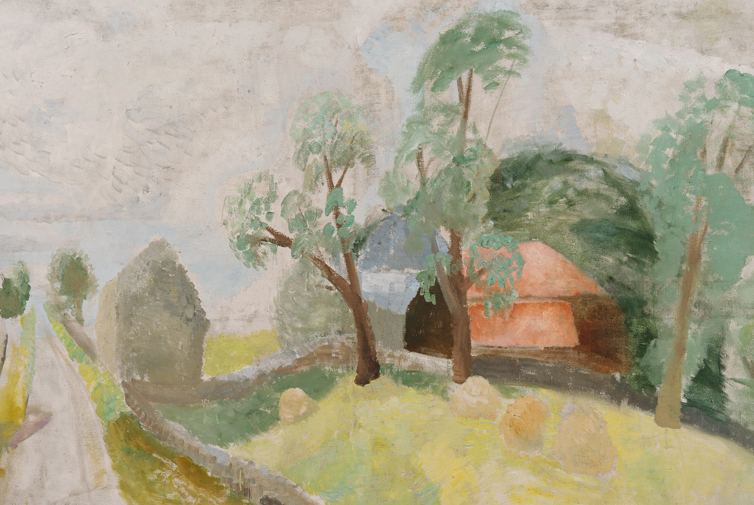 Jim Ede says in a forward to the house catalog that the idea began when he met Ben and Winifred Nicholson in 1924. 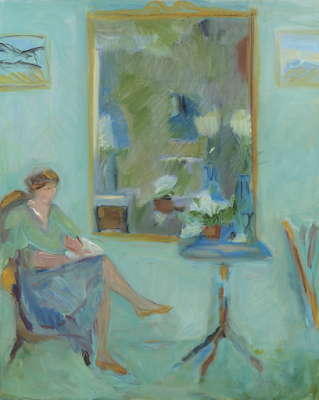 They inspired him in the way they fused art and everyday living. Jim Ede wanted to create a place to share a way of living and seeing art with visitors, and students in particular, to show art in a domestic setting. 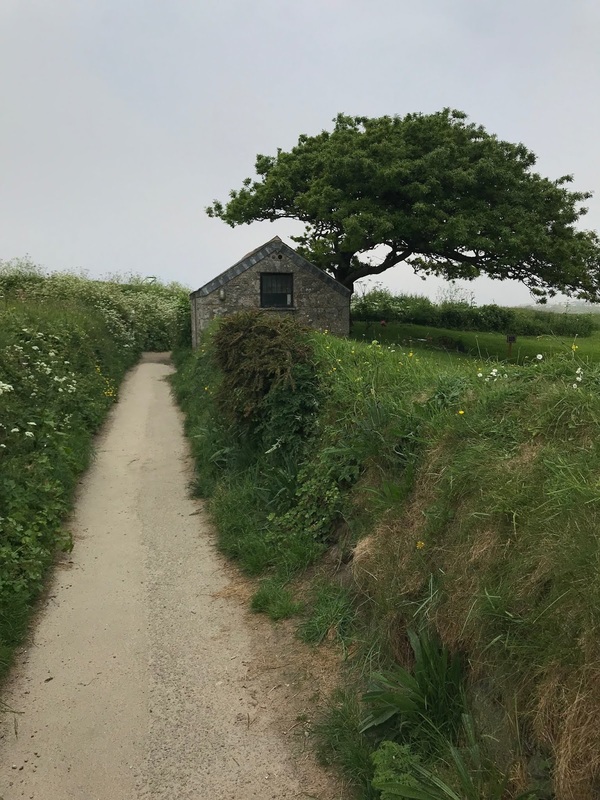 He worked with the university to find a location, which turned out to be four derelict 18th century cottages. 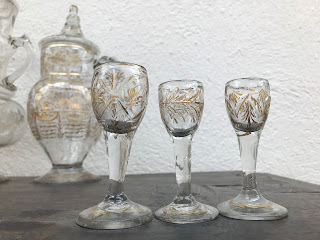 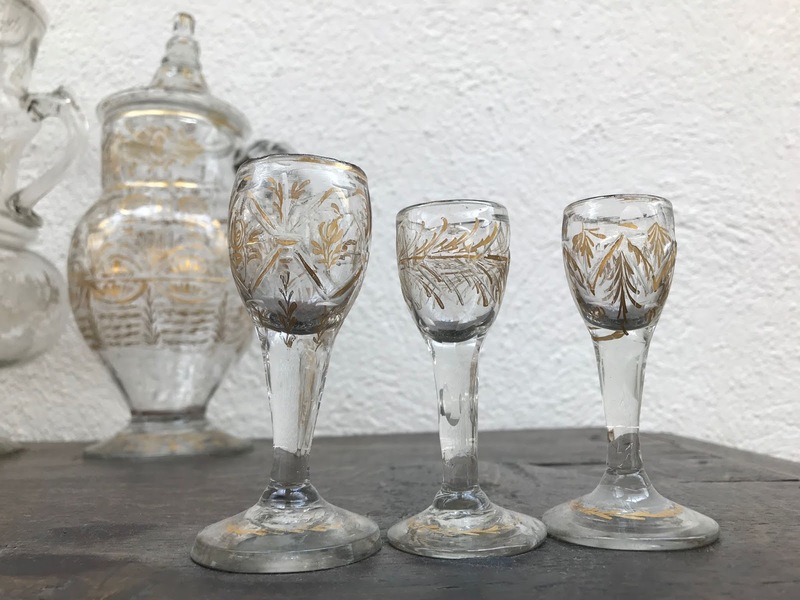 In 1956 they gave him use of the cottages, and he in turn agreed to donate his collection to them, make it livable and spend at least 10 years inviting students to open houses and musical performances. 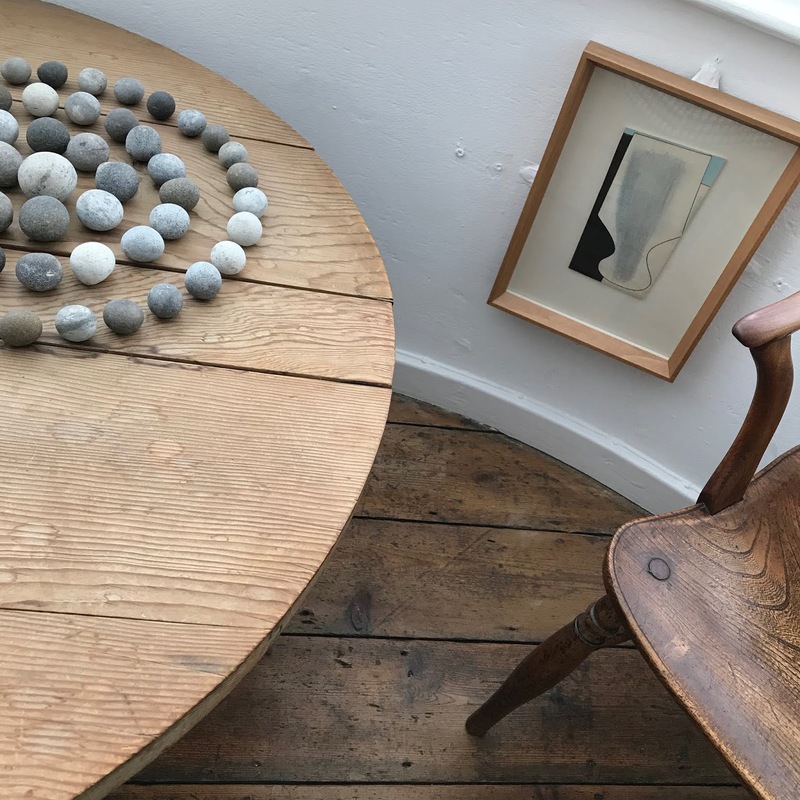 Jim and Helen ended up spending 15 years here, and since they left the curators have continued to maintain Ede's welcoming spirit. 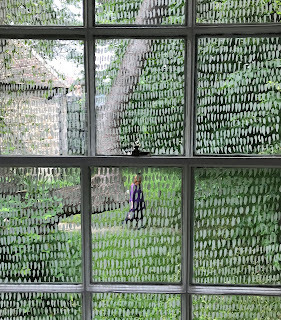 The house continues to be open to visitors 12-5 Tuesday through Sunday every week. 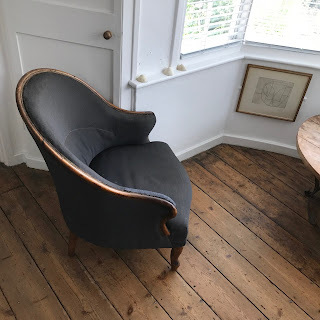 Above and below: An antique round back chair facing a table in a bay window. 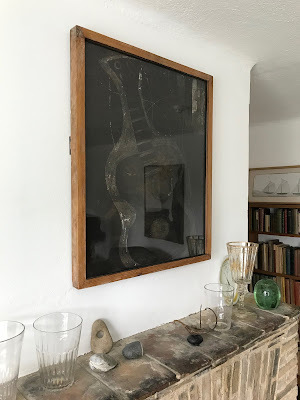 Ede hung artwork in unexpected places, such as placing these Ben Nicholson engravings below the windowsill. There are collections of stones throughout the house. This spiral arrangement was probably made by Ede. 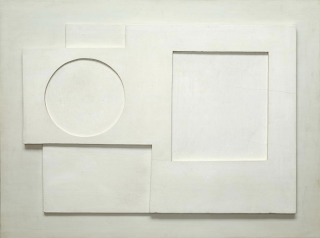 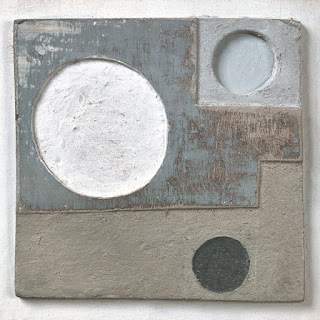 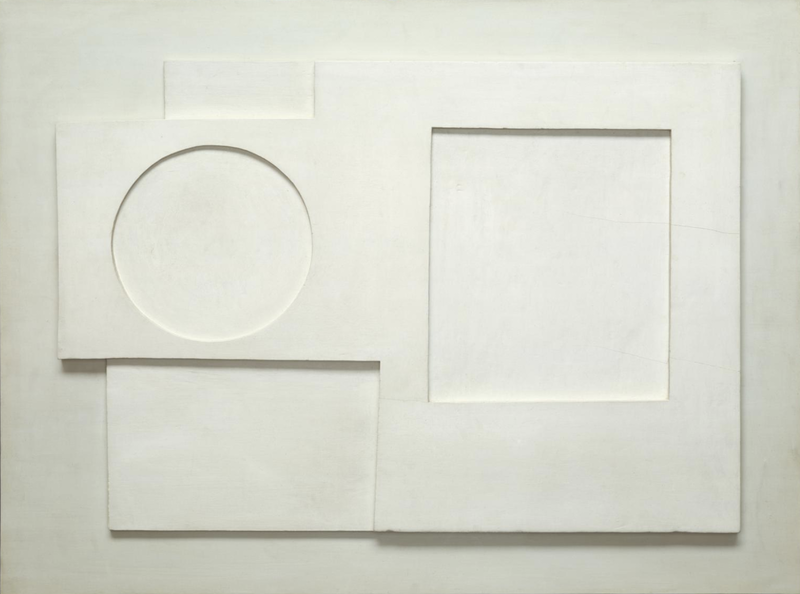 Above: Ben Nicholson relief design, 1934. Surprising that this very strong piece is only 3" square. It's pencil and gouache on incised cardboard. 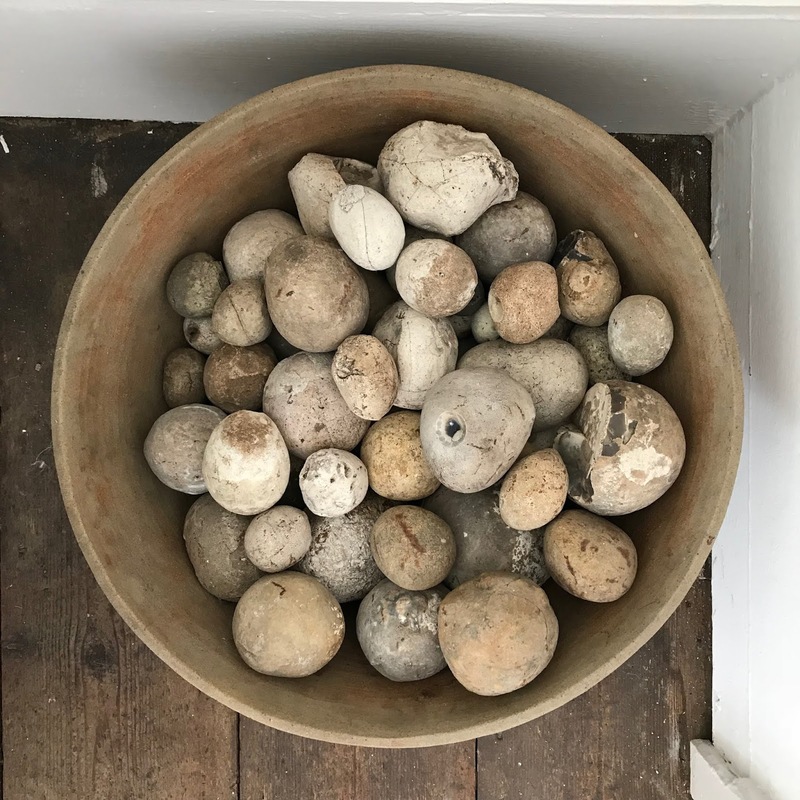 I like the connection it makes with the round stones throughout the house. 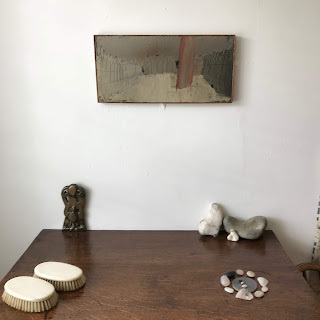 Above: A tableau on a dresser. 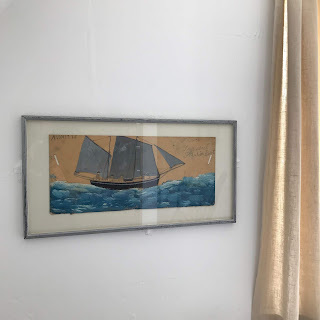 Above: Alfred Wallis painting. 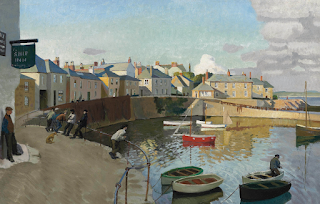 Wallis sent paintings to Ede constantly, charging just one, two, or three shillings depending on size. Wallis was extremely poor and painted on whatever scraps he could find. 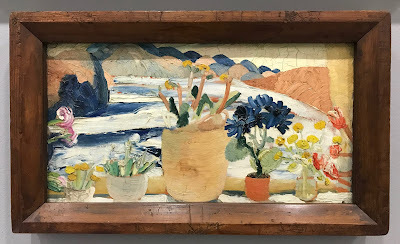 Ede couldn't always afford the paintings even at those prices but the collection wound up with about a hundred of his works. Above and below: The artist Cornelia Parker recently created this art installation on the windows of this bedroom in Kettle's Yard. 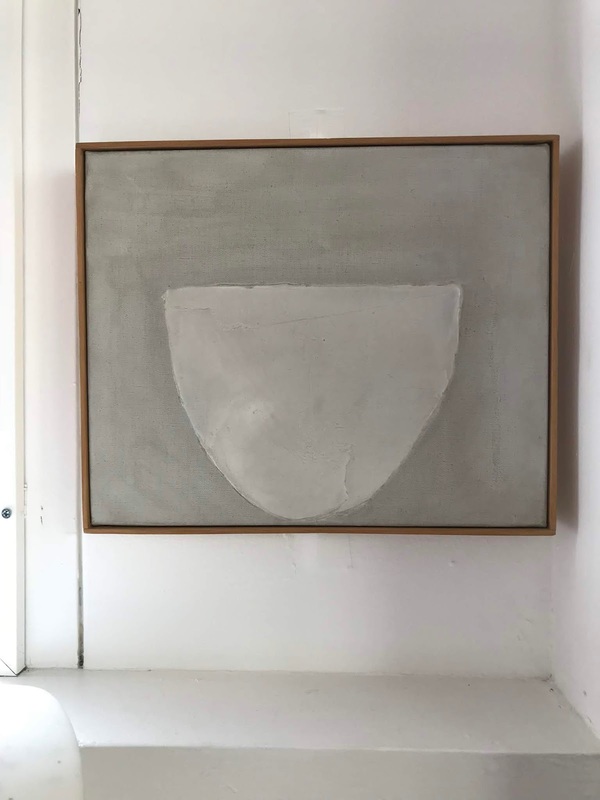 It was part of the re-opening exhibit for Kettles Yard this past February. 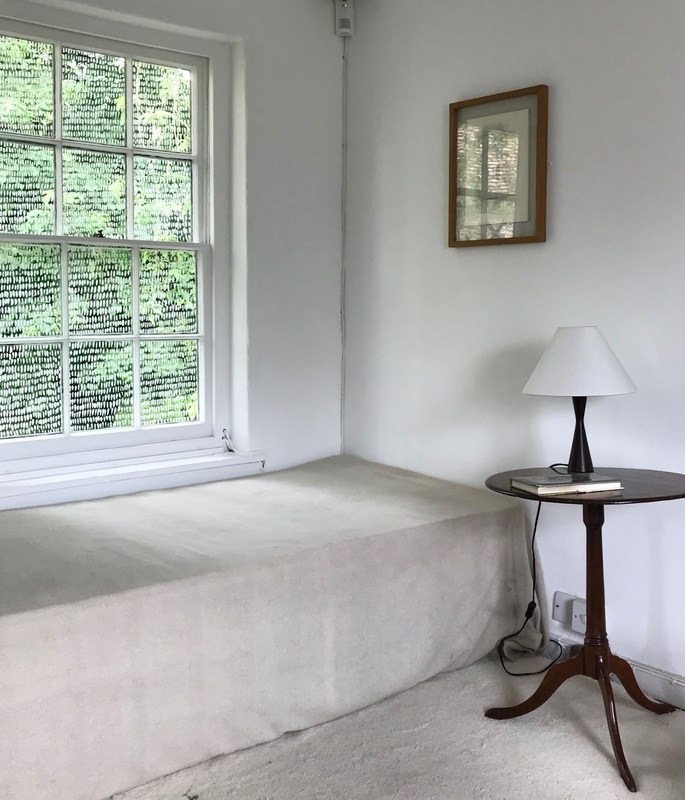 The house had been closed for 2 years of renovations and an addition. 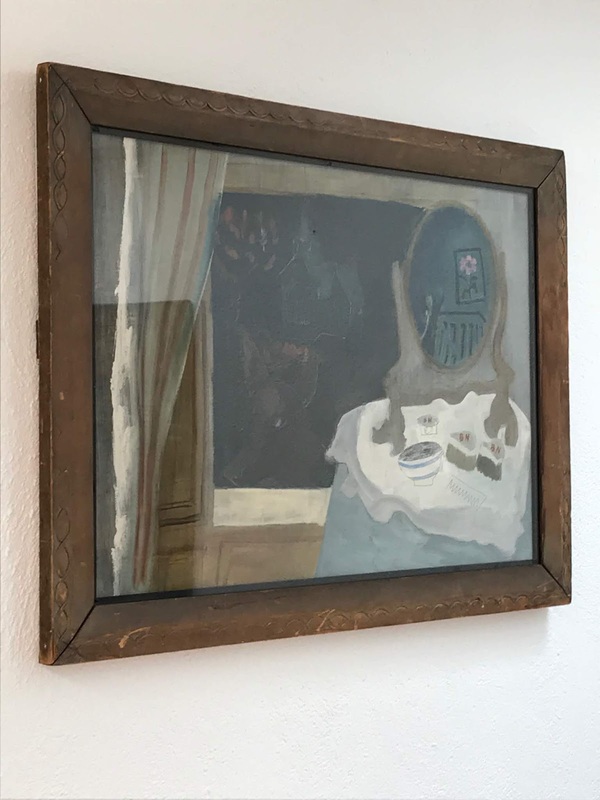 The exhibit was titled "Actions: The image of the world can be different". Parker created a subtle but lovely veil of dappled marks from chalk of the white cliffs of Dover. 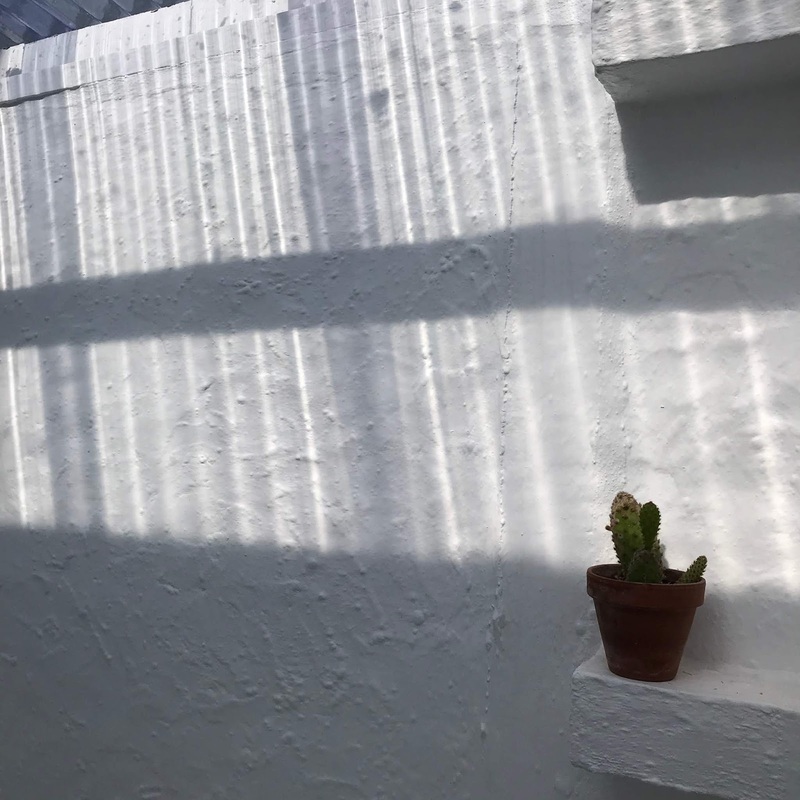 It creates a sense of both sanctuary and confinement. Above and below: Ede wanted to include domestic objects as well as artwork in this space. 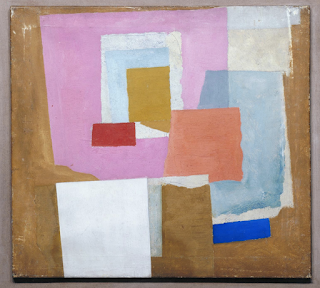 Above: A Ben Nicholson grouping over a wood and iron table. 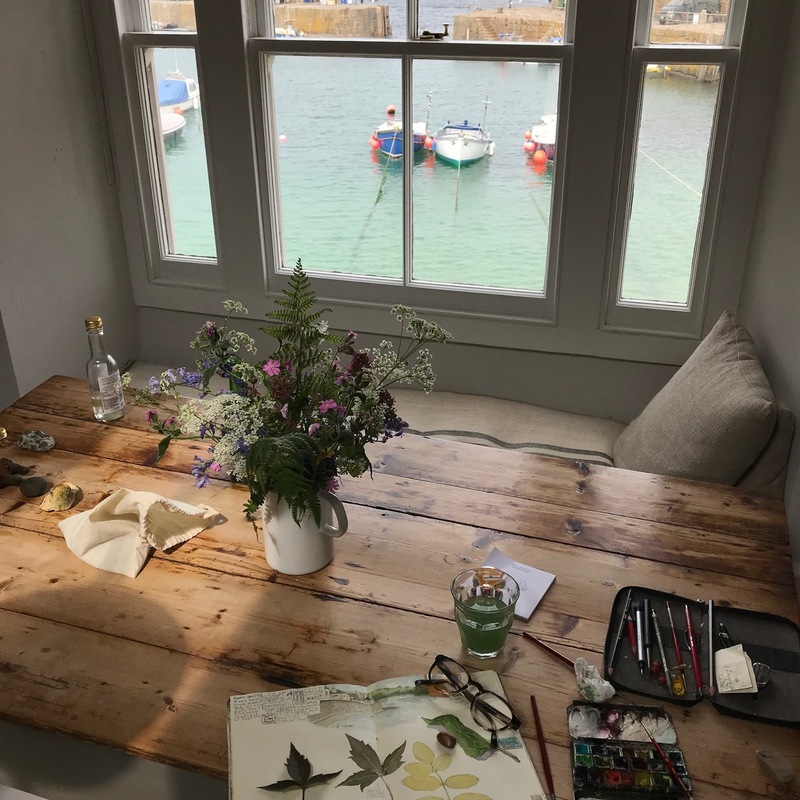 Above: Steven painted me in front of Winifred Nicholson's painting, one I've used in an earlier post. 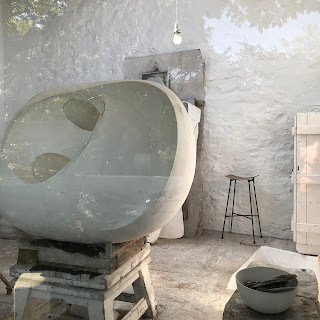 It was great to have a chance to see it in person. 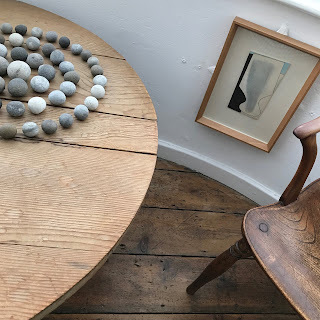 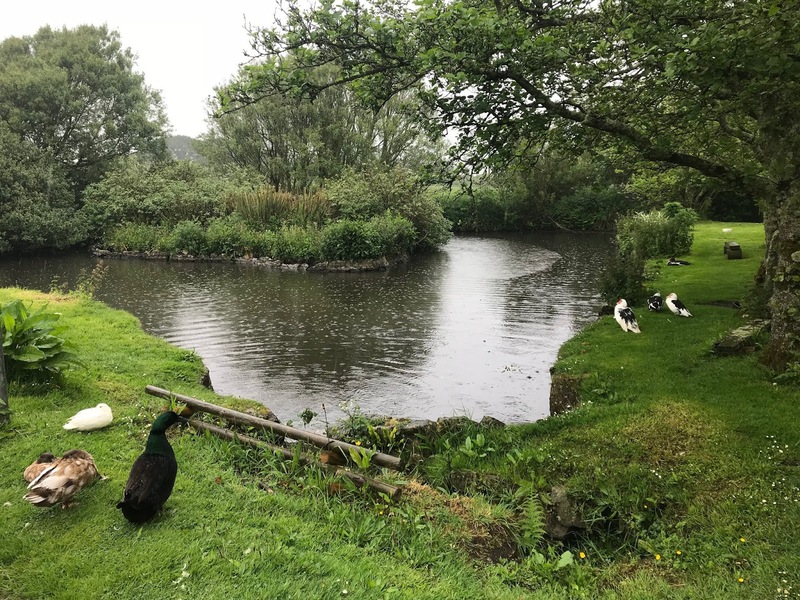 It was a wonderful thing to get to experience Cornwall and Kettle's yard just a couple of days apart. 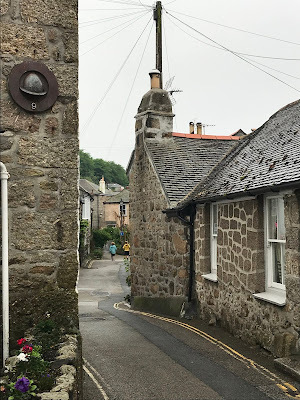 It felt a little like going back in time. The landscape and structures have hardly changed since these artists were gathering together in Cornish studios. 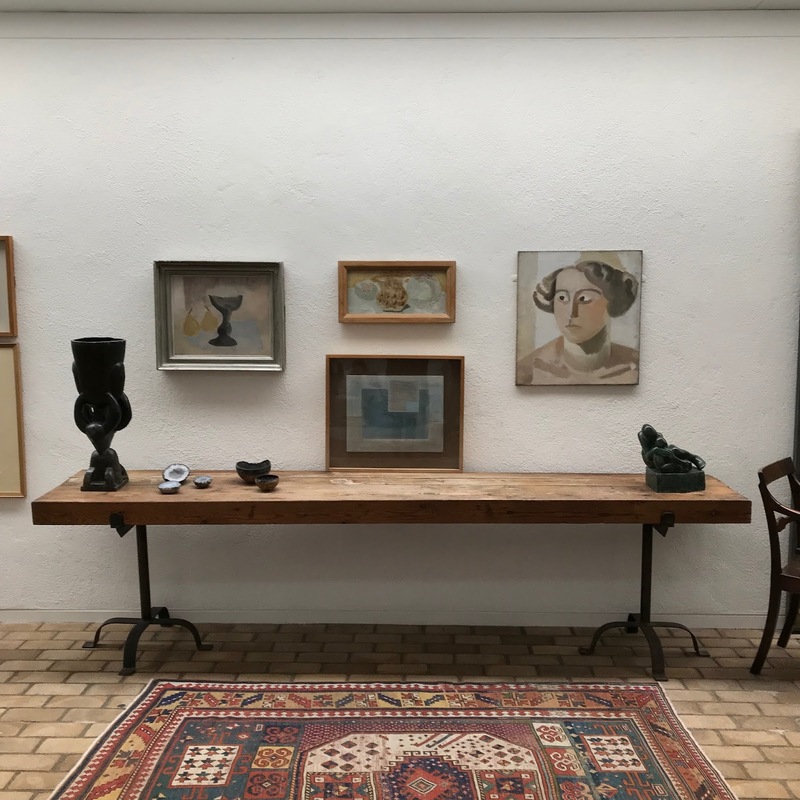 Kettle's Yard has held on to the sense of being a home that it was conceived to be.